So this is later than the usual Monday night. But I hope you’ll forgive me when you see the contents, and when you remember it’s December and that I now have a full-time job. SPEAKING OF WHICH, I have been fortunate enough to join a team full of kind and kooky misfits, who have made the last three months super fun. 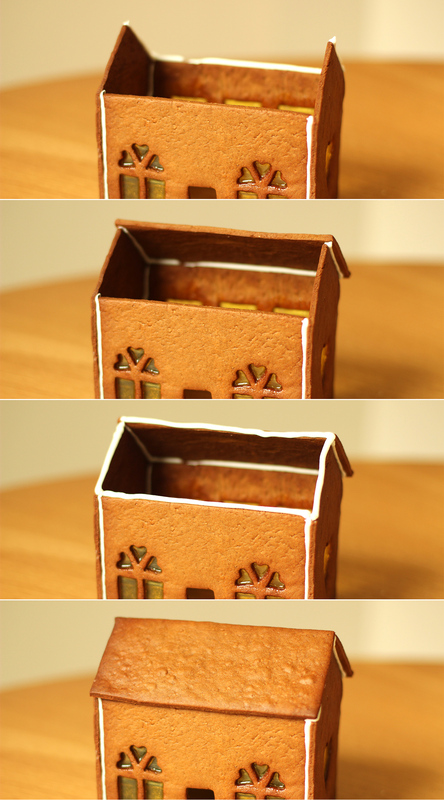 This year, when considering my yearly gingerbread offering I deliberated over how I might transport one into work to share the joy. 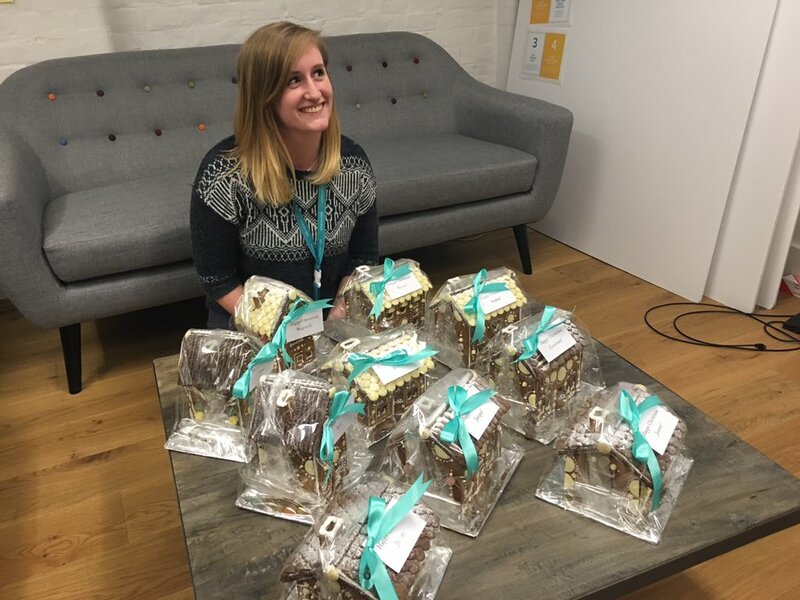 But when you make gingerbread houses like this and this and get the central line tube to work, even the thought of attempting that makes you sweat. The obvious answer? 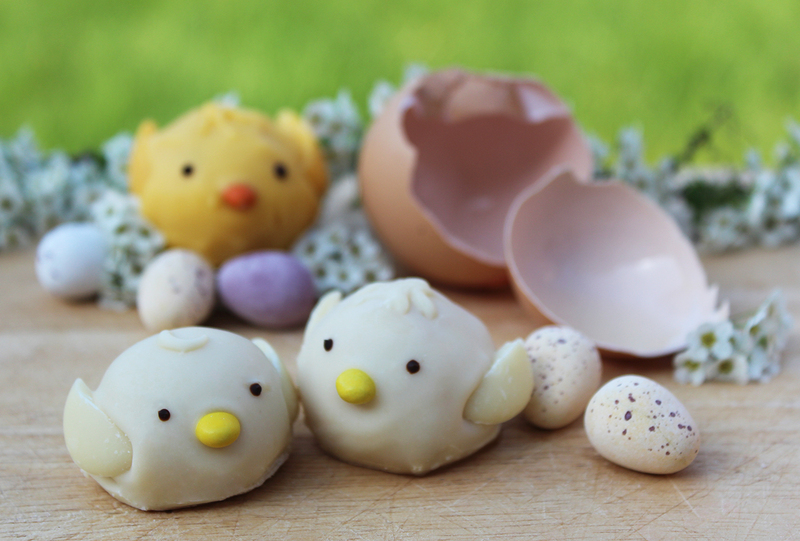 Make little ones for everyone. Sure. That’s not mental at all. 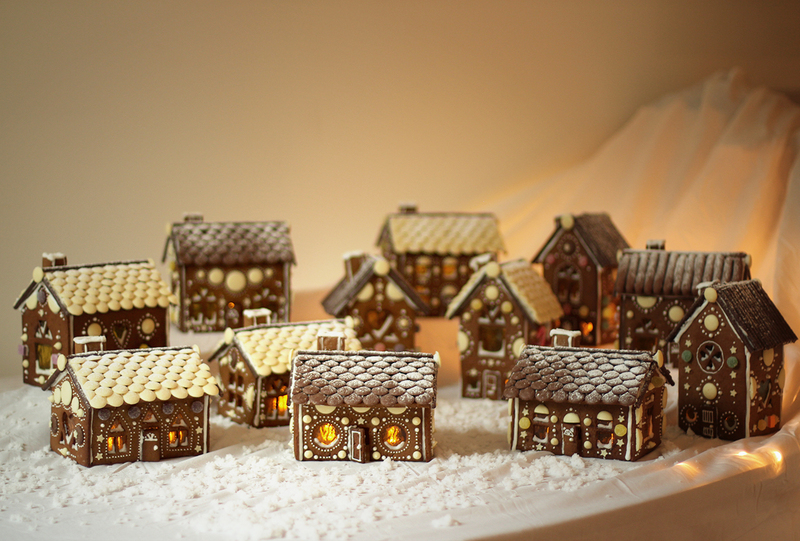 The quantities above make 4 little houses. Yes, I made 3 batches of mixture. It will make about one medium to large house, both the links in the blurb above required a batch and a quarter or so. You need a lot of royal icing, get a few boxes, I used 3 for 12 houses. For the bases I use a thick cardboard box covered in tinfoil. 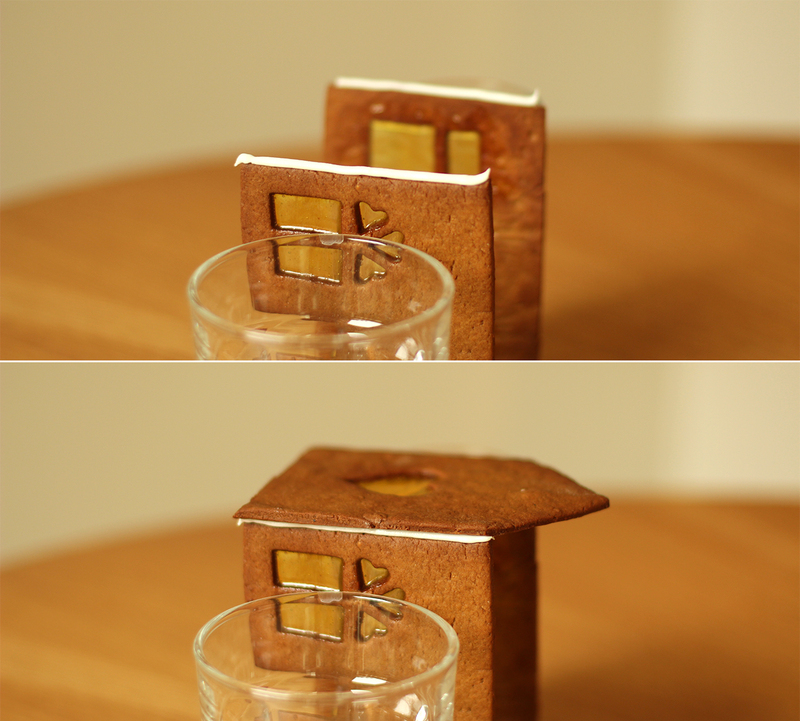 You could buy a cake board, but then you have to work out if your house will fit, or make it to fit the board. I prefer to make the base to fit the house, less restrictive that way. You are unlikely to complete all this in one day, as you need to let the dough cool before rolling it out, just a little FYI. 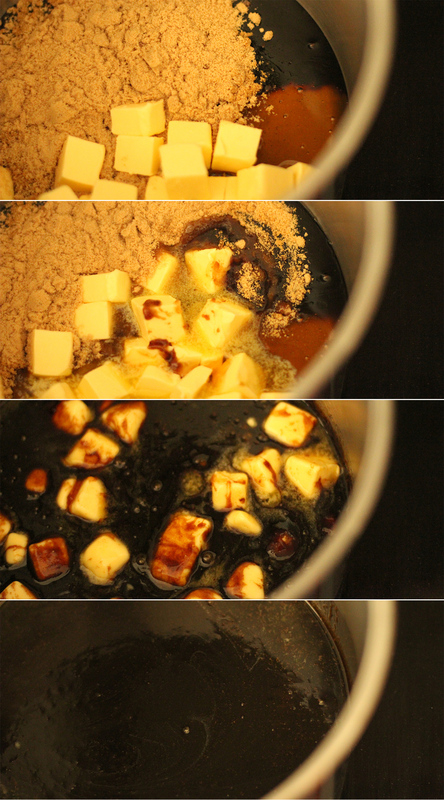 In a saucepan melt together the butter, treacle, sugar and golden syrup. Try not to let it get too hot. Mix together the spices, salt and flour together and make a well in the middle. 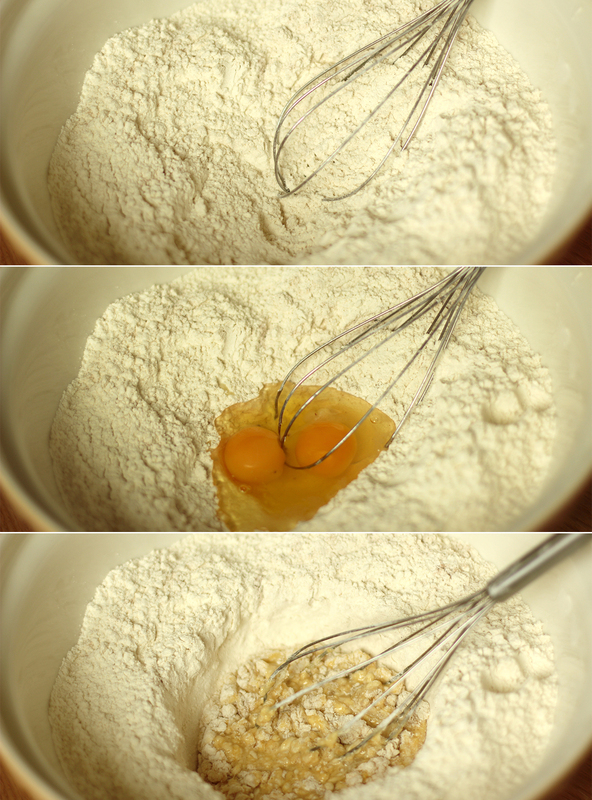 Add the eggs and use a hand whisk to break them up. 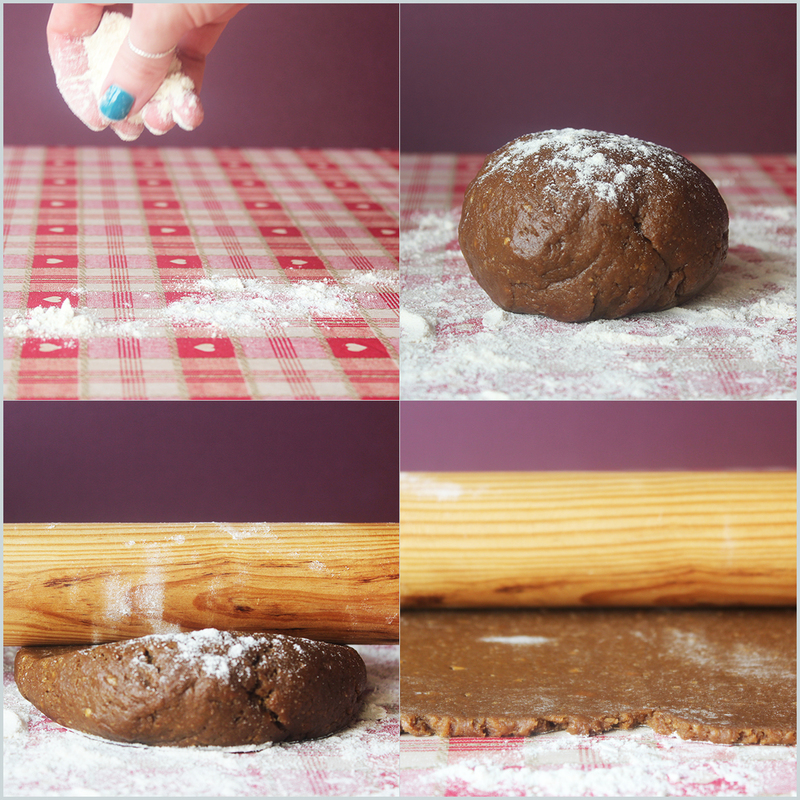 Start making small circles to incorporate the flour. 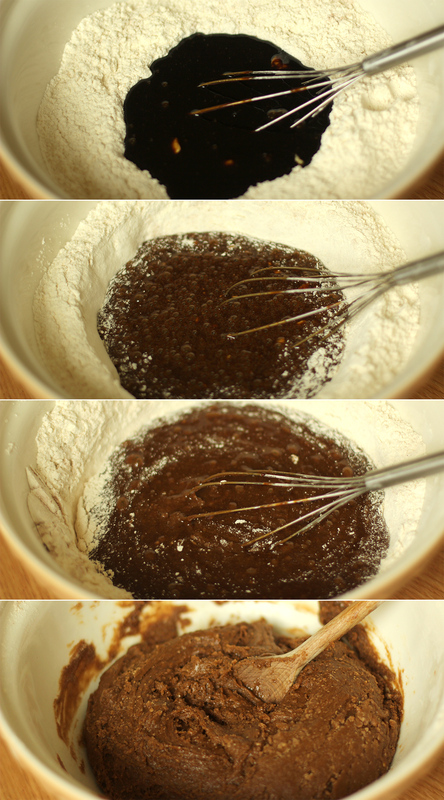 Pour the treacle mix into the well and continue mixing with the whisk for as long as you can until it becomes too hard to stir. Swap the whisk for a wooden spoon until fully combined. Allow to cool. Put it outside if it’s cold or in the fridge to speed up the process. It will be sticky but don’t add more flour. 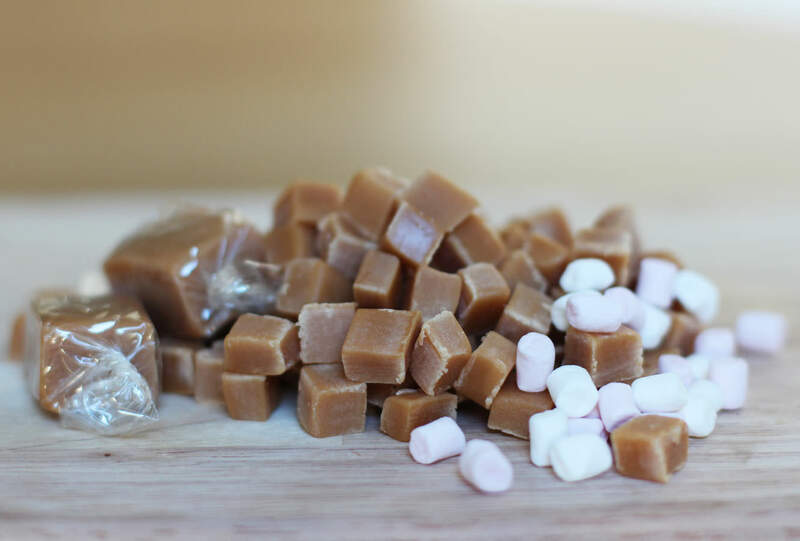 Bash up hard boiled sweets with a rolling pin in a sandwich bag, or use this life changing gadget, the mini food processor, to mush them instead. 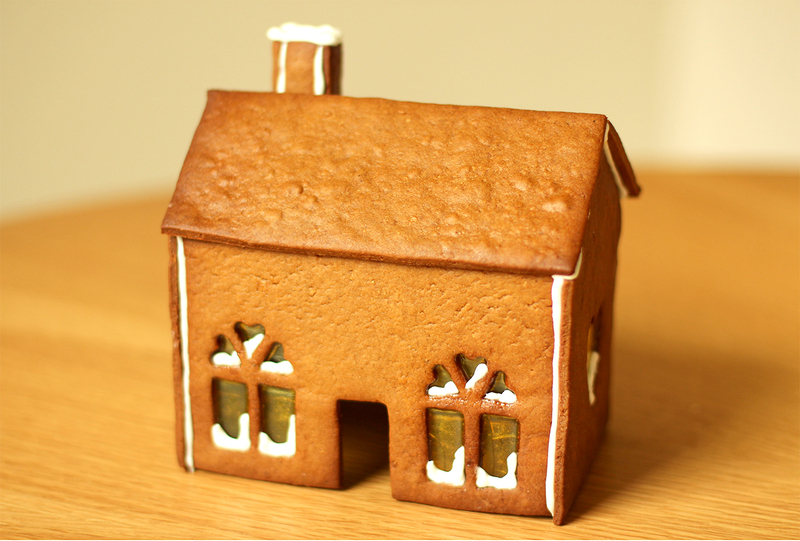 Once the dough has cooled it’s time to roll out the houses. Big, flat baking trays are best for this. Flour a surface and roll out the dough in batches. You will probably need to use a knife and a metal spoon to extract the mix from the bowl. Don’t fight it, it’s a winning formula structure-wise. 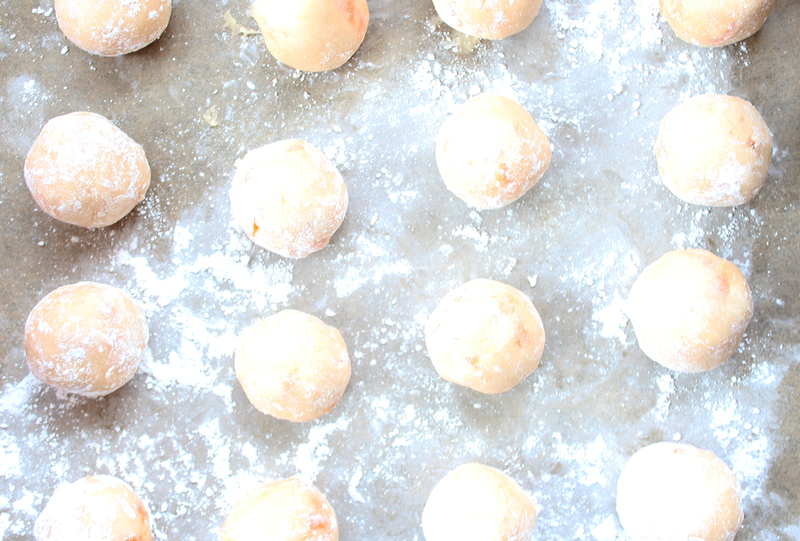 Roll a piece of dough to the same size as your tray for maximum efficiency re:oven space. 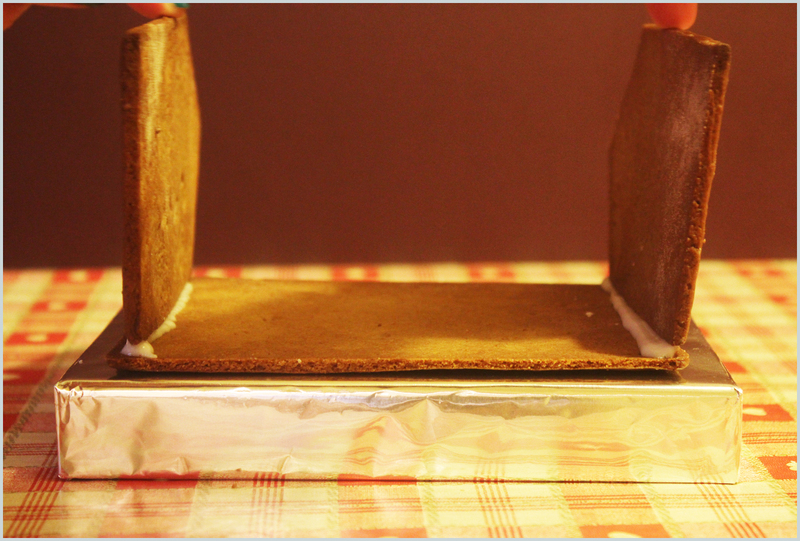 Use the rolling pin to lift the gingerbread onto a piece of gingerbread the size of your tray. 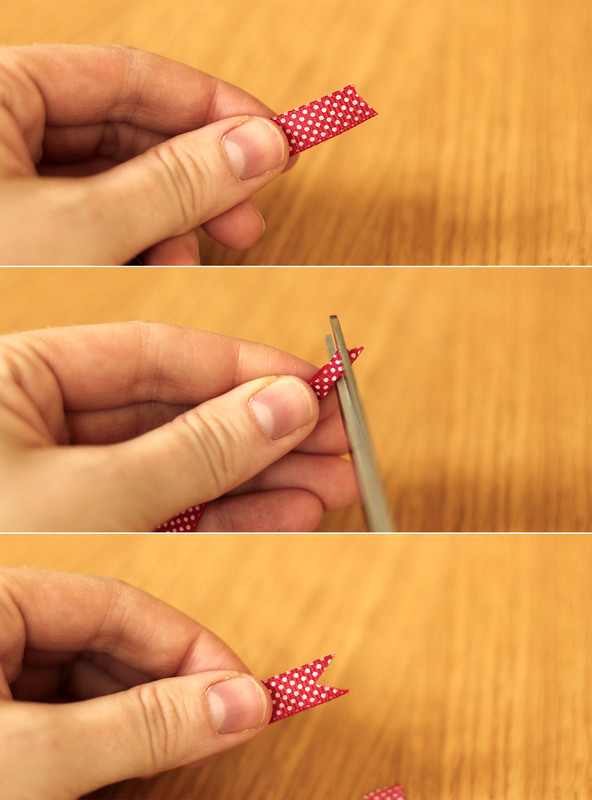 It is essential to do this before cutting; it stops you stretching individual pieces out of shape when you move them. Use the templates and a knife to cut the panels out. Contrary to the image above it’s best to do batches of the same shape – that way the bake is the right amount of time for that sized piece. The most obvious way to explain that little ramble is that the chimney pieces will cook a lot quicker than the side panel for example. 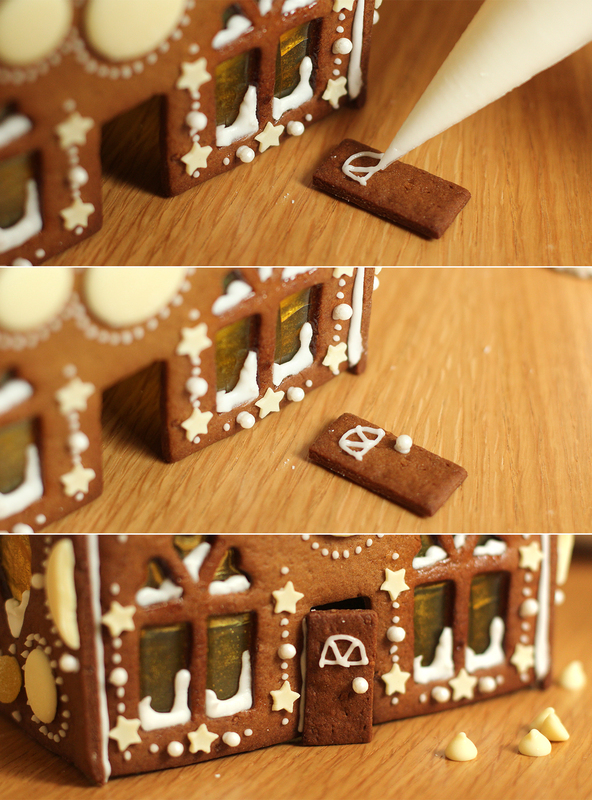 Transfer the gingerbread onto the tray and cut out window shapes. This year I invested in a little cutter set of different shapes and sizes. It was amazing. 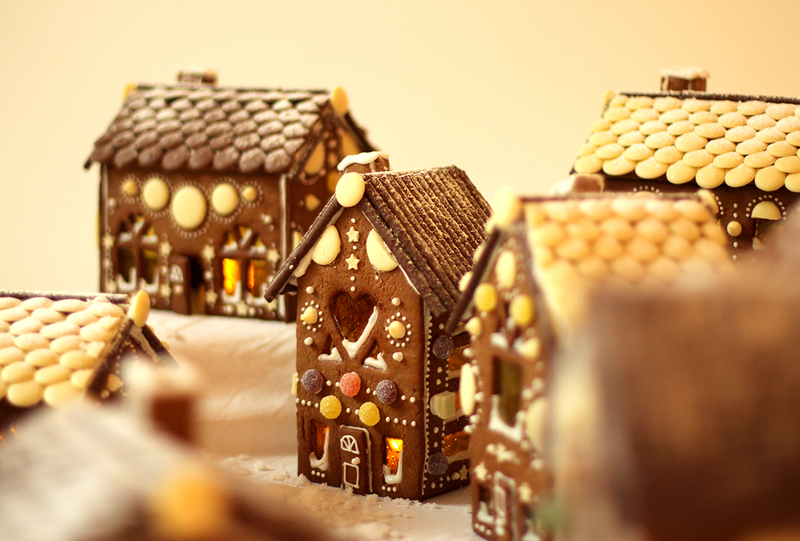 Total gingerbread game changer. Fill the gaps with the sweet crumbs. This is why you need baking paper. 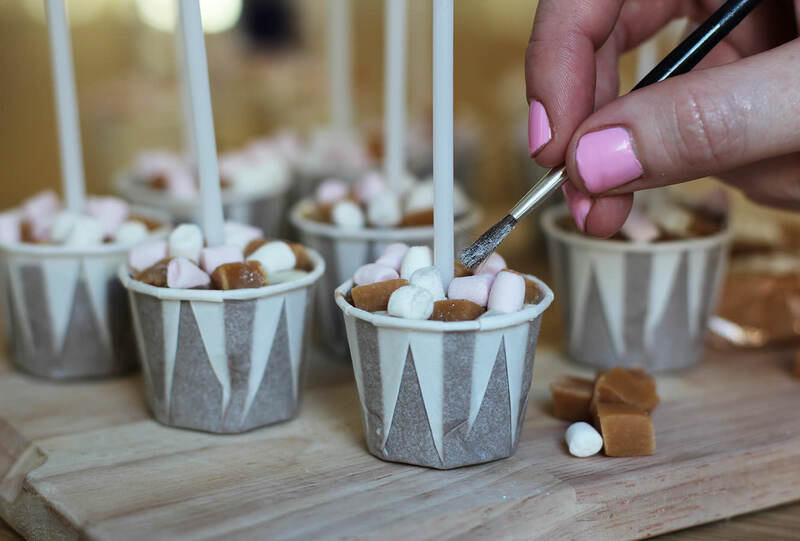 Otherwise the sweets melt and glue your house to the tray. Bake on 180C/gas mark 4/350F for 10-15 minutes. Over-cooked is preferable as they need to be able to stand up, and they will get softer as they sit out. Time to assemble. Mix together the royal icing making sure it’s really thick, it will stick better and dry quicker if it’s opaque white and not that sticky to touch. If you’re making a big house, have a spare pair of hands at the ready and/or a lot of glasses and bottles to prop things against. These little ones are actually really easy to put together in comparison. Start with one side flat on the table. Pipe two even strips along each edge. Stick the two matching sides to this piece, propping them up with a glass so you have your hands free. Pipe along the top edges and stick the final side piece on the top. Flip the house upright. If you’re making a big house put it straight on the base at this stage and pipe on the inside corners to re-inforce the house. Less important with these little guys. 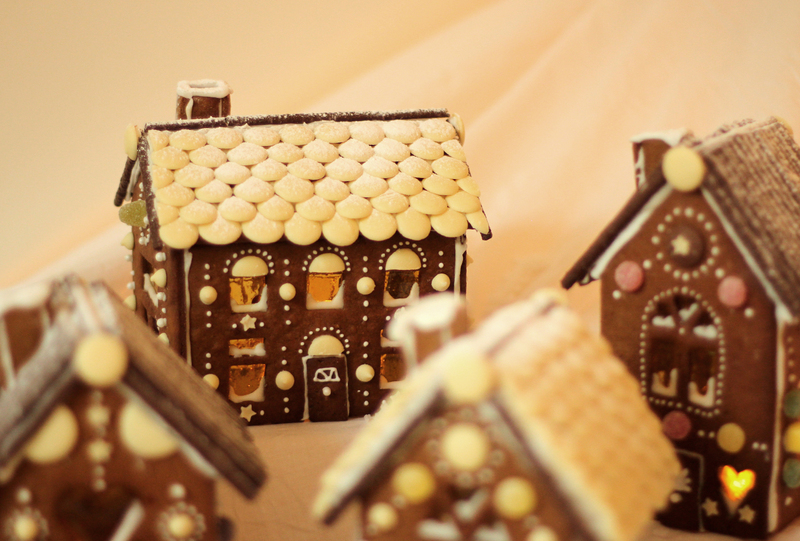 They are actually great ‘starter houses’. Yes I do a bit hate myself that I say that, and many of my other tips with ZERO irony. Pipe along the back sloped edges and the back. Stick down a roof panel. The straighter edge should be at the top, as you are more likely to cover irregularities at the bottom with a bit of overhang. Pipe the top of the roof, the sides and edge. Stick the other roof panel down. Make the chimney in the same way, and attach it to the roof. Pipe some snow in the windows while the piping bag still has quite a thick opening. Start tiling! Make sure the first layer overhangs the bottom of the roof, and build up subsequent layers by overlapping them as shown. 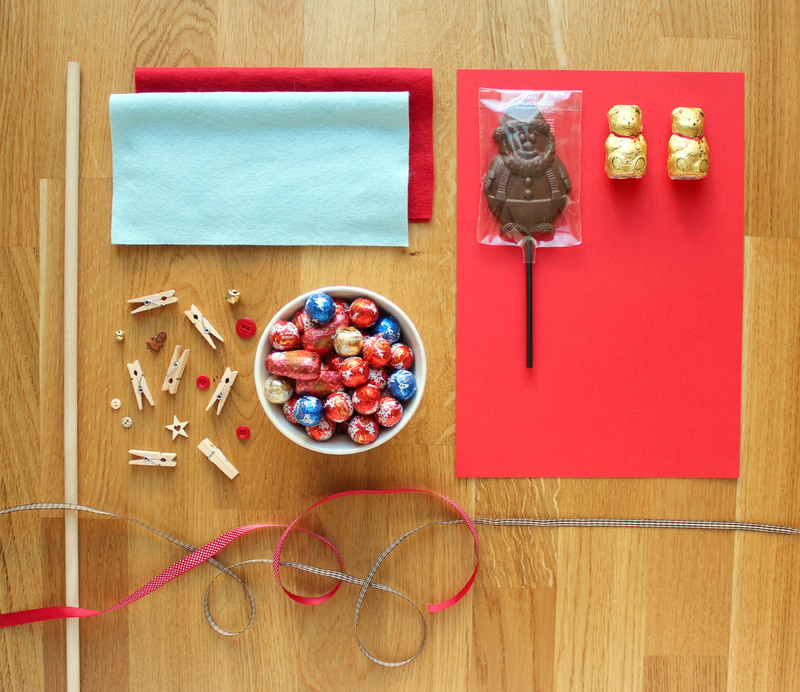 Neaten up the edges with chocolate fingers or matchmakers and a chocolate button or two. 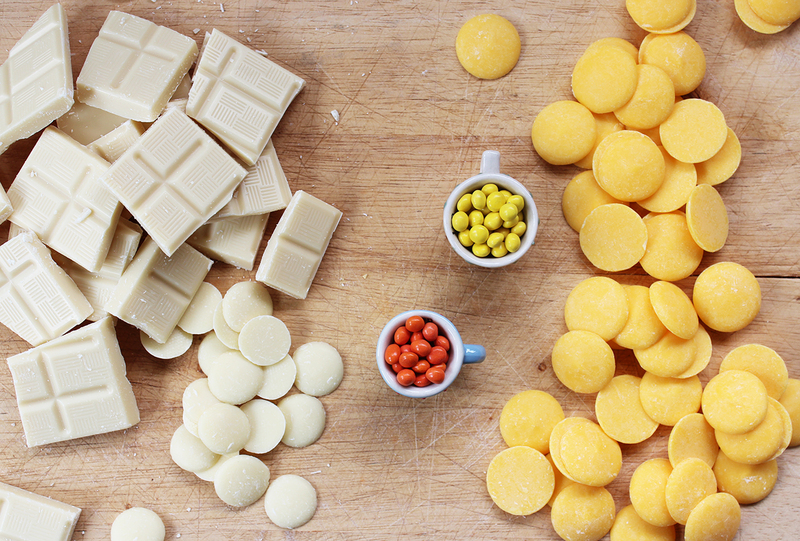 A row of dolly mixtures along the top, or mini marshmallows looks cute too. Continue to decorate the sides and the back. I find a much narrower nozzle on the piping bag is good for this. I like putting these little dots around things. 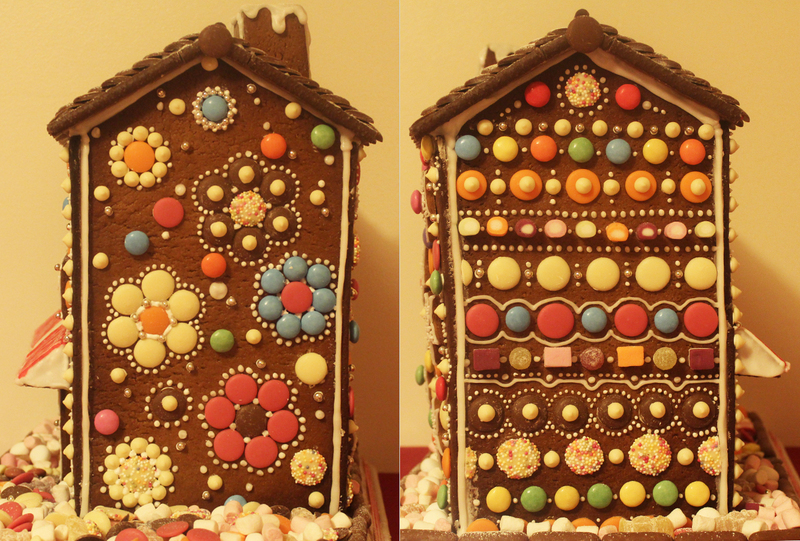 This year I used a lot of white chocolate buttons, I don’t have much choice in the local small supermarkets nearby. 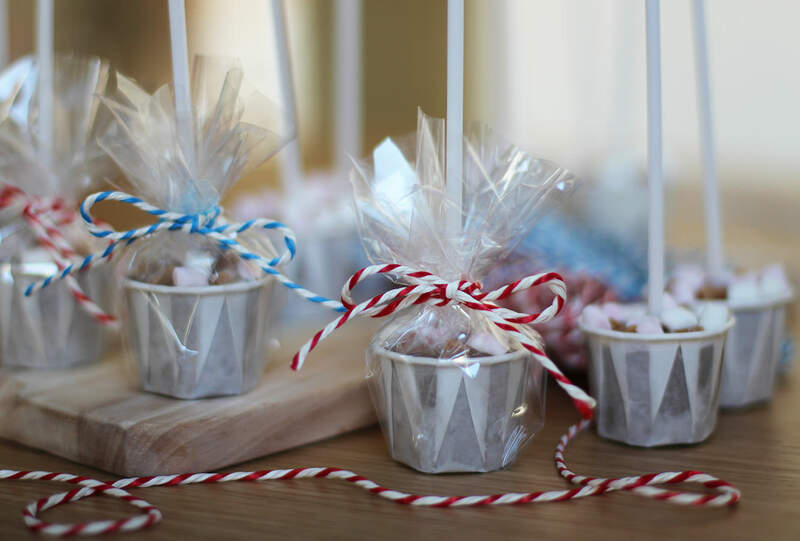 Silver balls, mini stars, chocolate drops and other round sweets are amongst my favourites for the decorations. Don’t forget the little door! 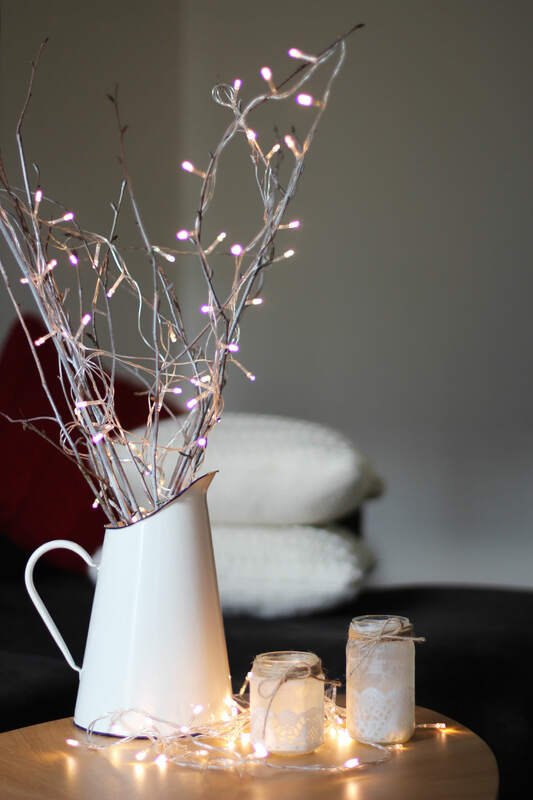 I wouldn’t attach it at this stage if you are doing a big house, because you need to squeeze the tea lights through it. The little ones can just be placed over the top of them as they don’t need to be attached to a base at this stage. Here’s a snap of me (with the reddest face, thanks blushing reflex) that was insisted upon, and all but one of us (come back Saskia!) in the obligatory family photo. How did I get them into work? A special train, a suitcase and some blankets. 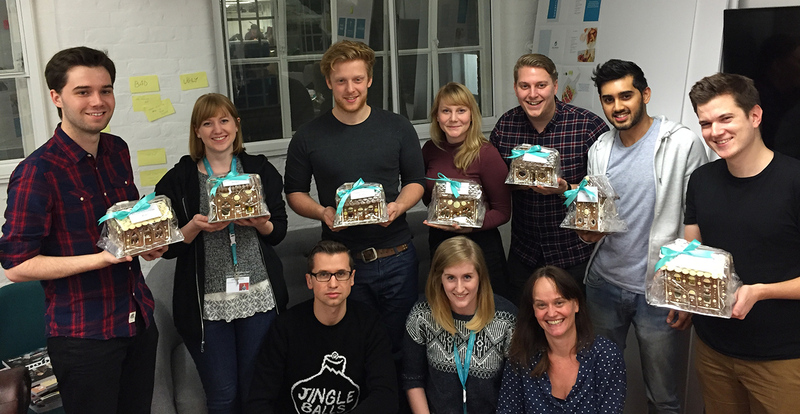 Two years of fabrefaction.co.uk friends. Yup. THAT HAPPENED. Thank you for the support and the loving, please keep sharing, commenting and messaging me; I love hearing from you and seeing what you’ve made. 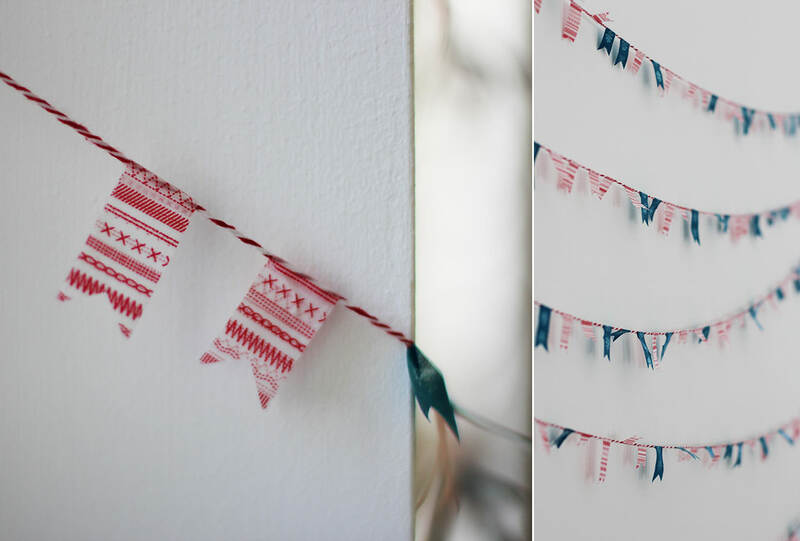 In keeping with my first post ever, and the one year anniversary post of this little blog, here’s another lovely advent calendar for you to make. “Oh but advent starts next week, I don’t have time!” Yes, yes you do. I made this in a day. Less than really when you consider I went out for breakfast and dinner. You could even take the easy way out and glue instead of sew. This particular calendar is a labour of love for my very hardworking and wonderful sister. Poor duck got jealous of mine once, and this year I thought it was about time she had something a little more permanent so she never forgets again. Thanks for your love and support sib. Depending on the length of your dowel you might need to cut it down. Mark the cut point at 40cm. Cut the end of the dowel off. Those of you into wood work (of which I am sure there are plenty) don’t judge me for my saw, I’m relatively confident after using it that it wasn’t the right choice. 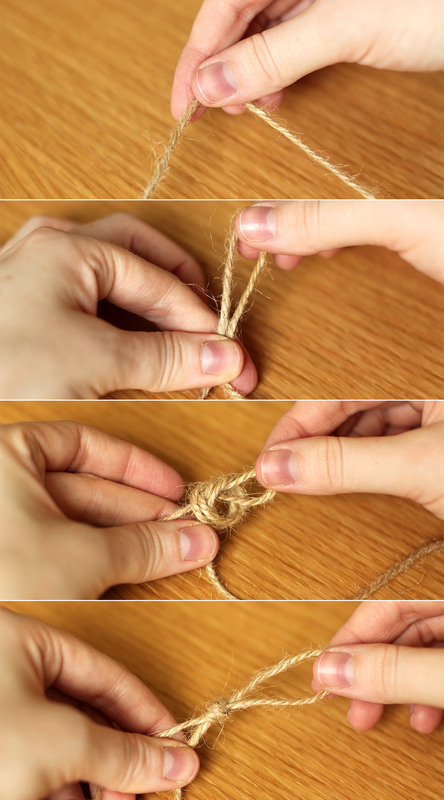 measure a length of twine/string/ribbon about twice the length of the wood and double knot tie it onto either end. You might want to add a little glue to secure it. Make sure to turn it so the knot is at the back. 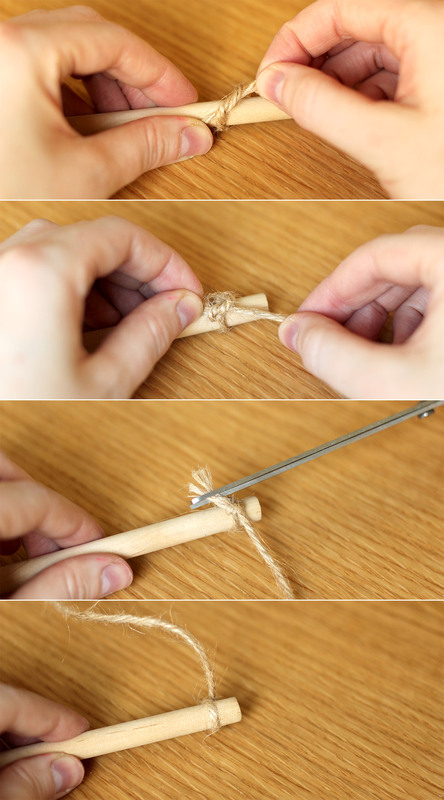 Hold the centre point of the twine and allow the rod to hang off the side of the table. 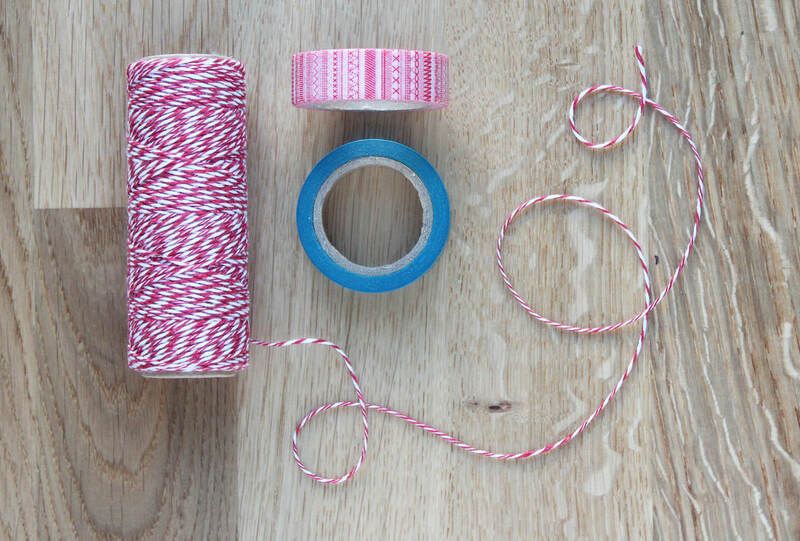 Make sure it’s level and tie a knot in the middle so that you have a loop to use for hanging. 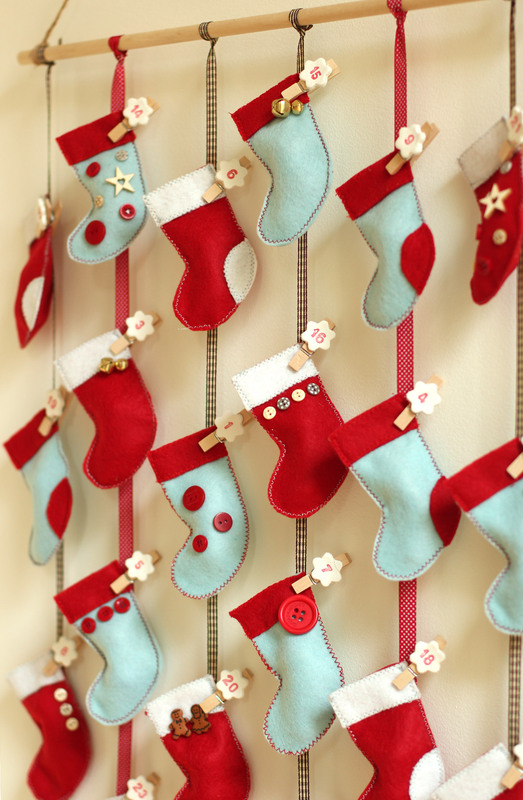 Using the template cut out 23 mini stockings (2 pieces of felt for each). I cut through two layers at a time, and squeezed 8 cut outs from each square of felt. If you bought A4 sheets I imagine you’ll get 10-12. 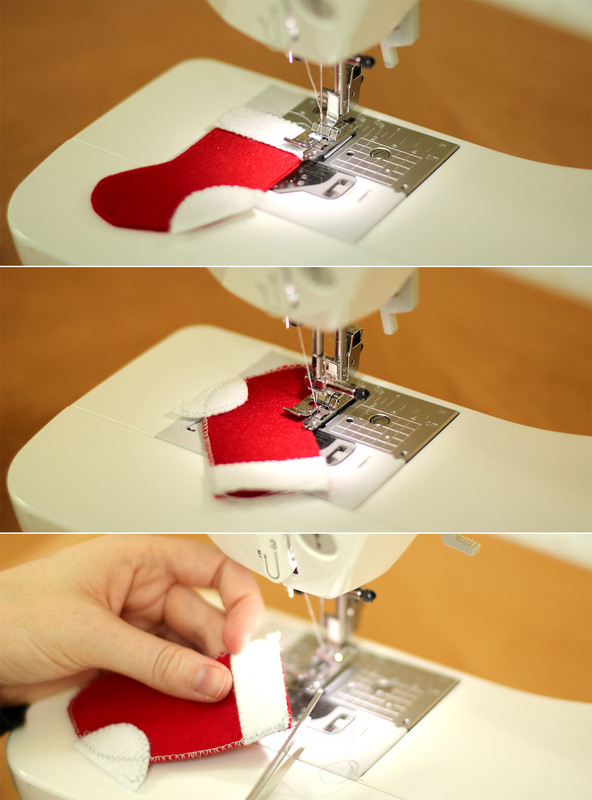 Sew the stockings together using an overlocking or zig zag stitch. I edged the white bits separately before attaching them and left the heel hanging over the edge. If you are making this for next Christmas, feel free to hand sew. 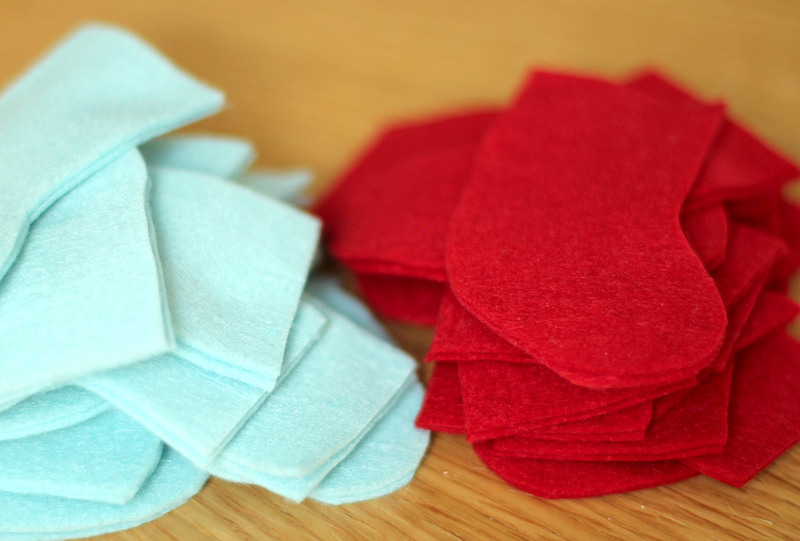 I cover how to blanket stitch here. If you want this ready in time for this advent I recommend borrowing a sewing machine or using glue. 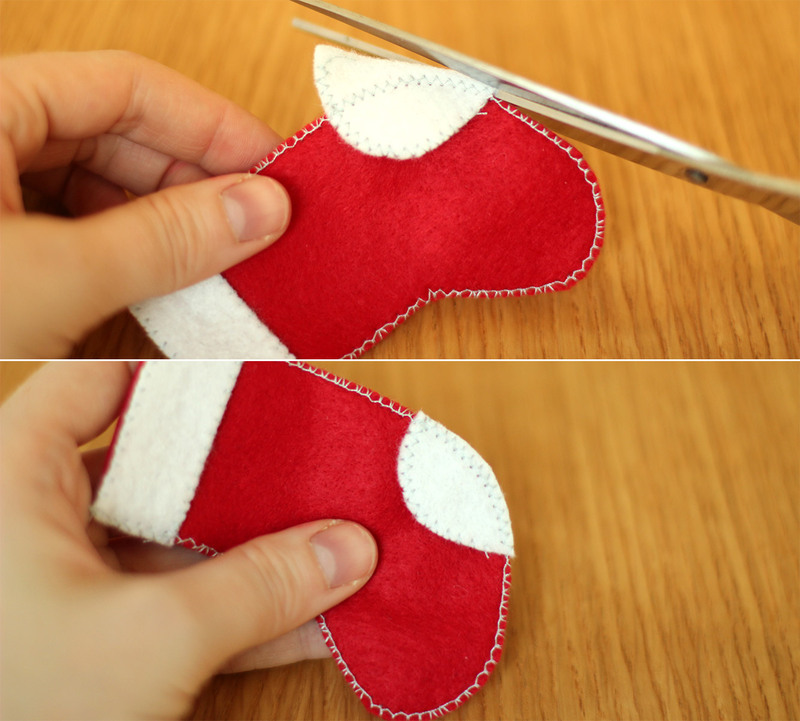 Cut the excess off the heel of the stocking and any loose threads. 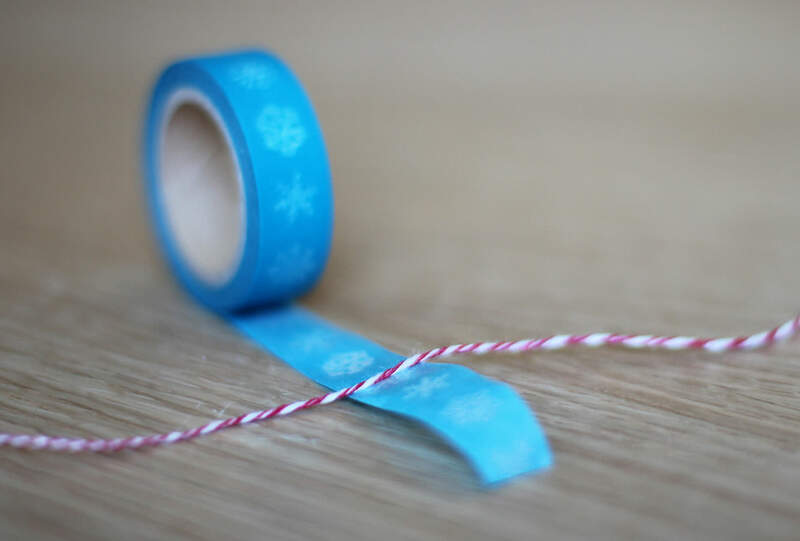 Secure the heel with a little dab of glue, but make sure it doesn’t soak through and stick the stocking together. I decided not to sew heels on all of them as I wanted a bit of variation. 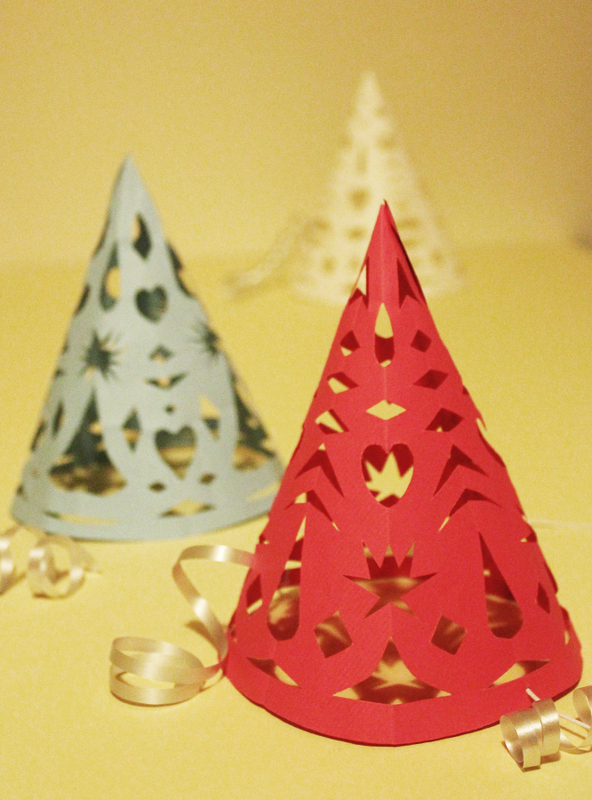 So I used some of the embellishments from last year’s advent calendar to decorate. Glue is acceptable here I reckon, otherwise you really need to sew them on before sewing them together. 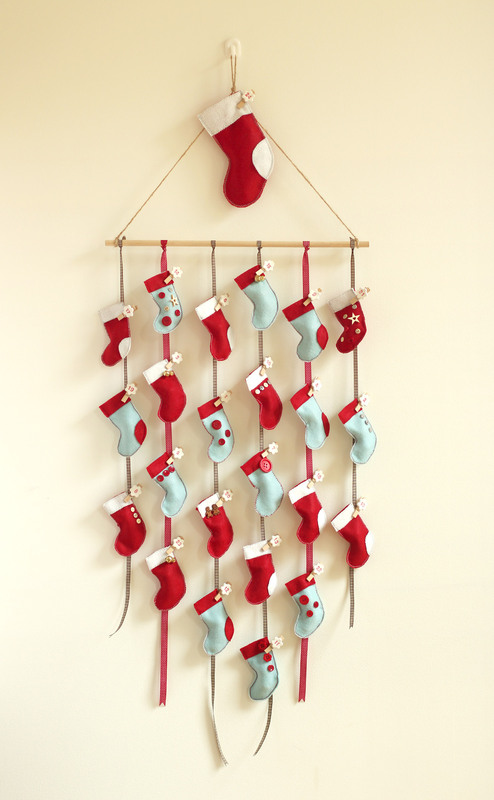 Repeat until you have 23 little stockings and one big one. 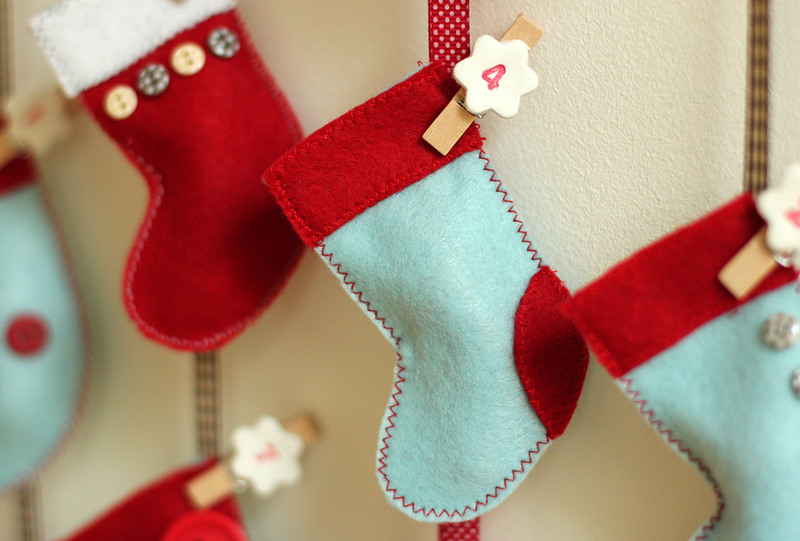 Fill your little stockings as you go, they look very cute as they stack up. After a few learning lessons from last week, I made the number markers with air dry clay. I found it easier to work with than FIMO. It also worked really well to ink the stamps before pressing them into the shapes. This is entirely optional, you could write the numbers on the pegs, stamp them, make circles of card instead etc etc. Once the shapes have dried out (no cooking required with this clay), stick them to the pegs with enough space at the top to open and shut the peg without squashing them. Cut 6 lengths of ribbon. I decided to taper mine at different lengths, as you can see in the final photos. 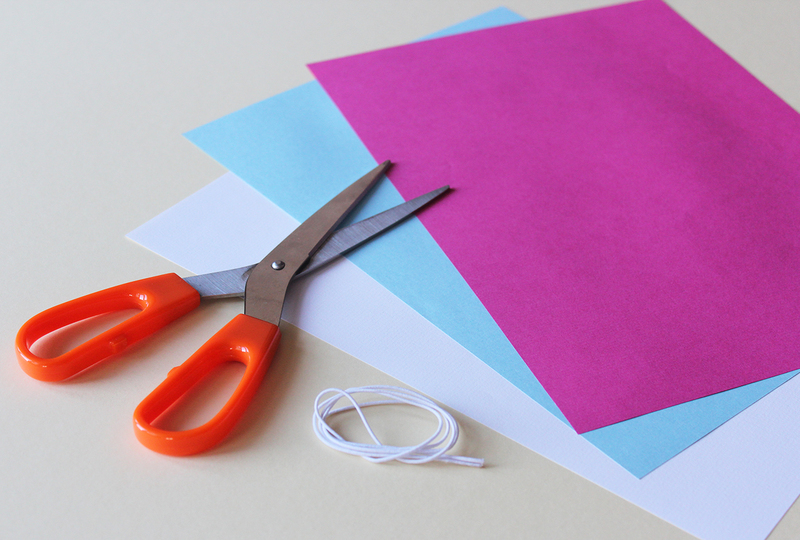 To shape the ends nicely, fold the ribbon in half and cut diagonally on the fold to create a v-shaped cut. Tie the ribbons onto the rod and peg the stockings on. Apologies for the day late post friends. I had a miniature pie melt down at the weekend (#myblogginglife) and as a result didn’t fancy posting yesterday. Instead I took an evening of sitting on the kitchen counters with the housemates eating pumpkin pie. Speaking of the housemates. A while ago one of mine professed herself to be a food innovator. Bold claim? Yes. I thought so. When I asked for proof of this theory, she was ready with it. 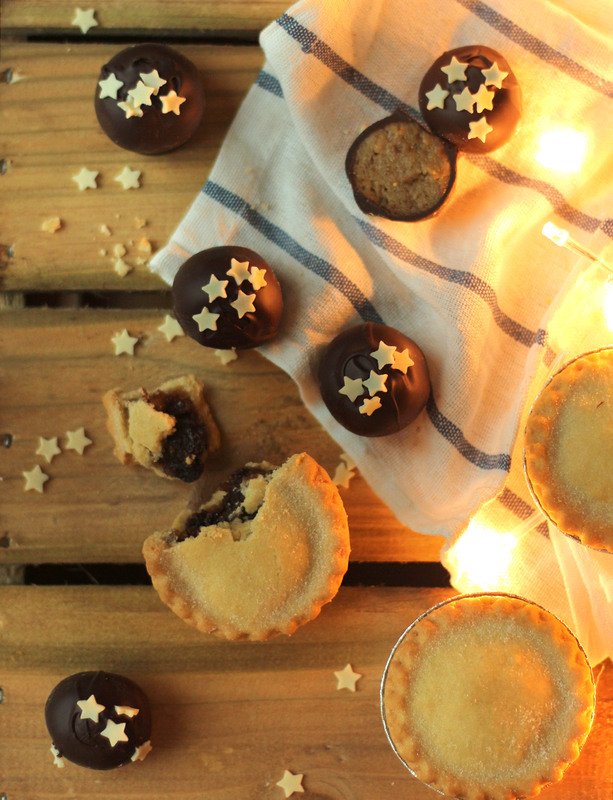 “Well,” she said calmly, and with an air of smugness, “I’ve had an excellent idea for mince pie truffles”. Lover of mince pies I am. Did I think this idea was a good one, worthy of the self proclaimed food innovator title? No, reader, I did not. About a week of scorning later (I cannot put words together to explain how disgusting I thought the idea was and how aggressively I communicated that to her) she returned home with a box of mince pies to prove her idea, totally unfazed, a quality all struggling food innovators must no doubt possess. I’m sure Heston could empathise. Anyway. 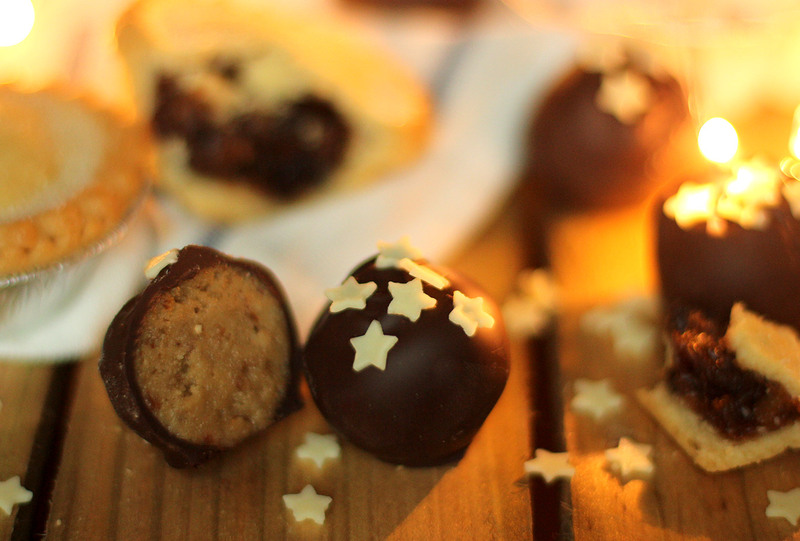 Turns out, I like mince pie truffles. You’ll have to trust me on this one. Best eaten from the fridge, sound and look entirely unappetising, ladies and gentlemen, I bring you the recipe for the humble (but great) mince pie truffle. This post is dedicated to one Ms Afua Addai-Diawuo, food innovator. 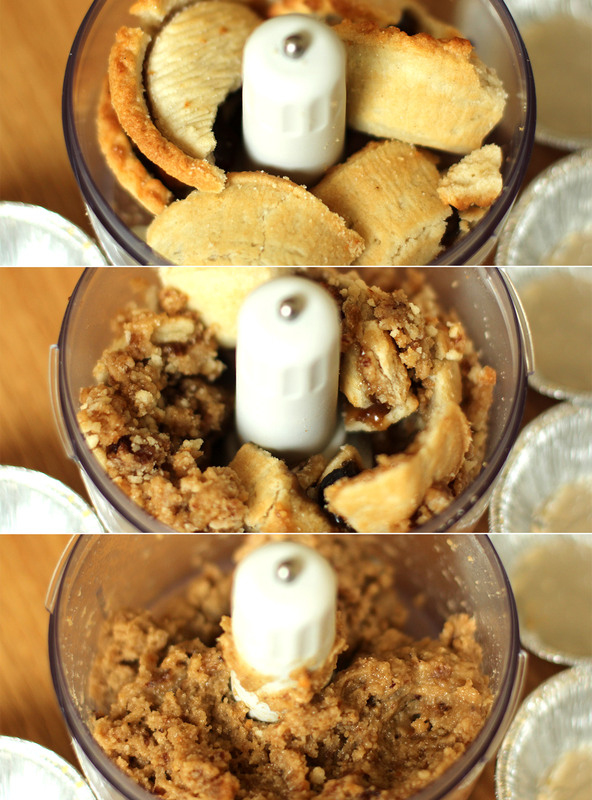 Using a food processor blitz the mince pies until they are a dough like consistency. It will be very sticky so you will probably need to put the mixture into the freezer for about 30mins to an hour. Roll the dough into evenly sized balls. 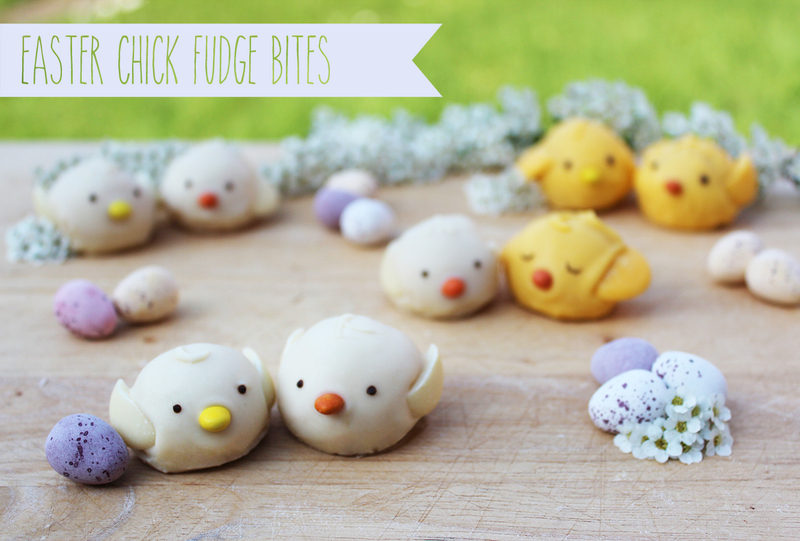 Put them back into the freezer for a while longer, until solidified. Melt the dark chocolate and dip the truffle centres to coat them and leave them on some cellophane or greaseproof paper to dry. If you want to see how to dip them, I cover it a little more thoroughly in this post from two weeks ago. 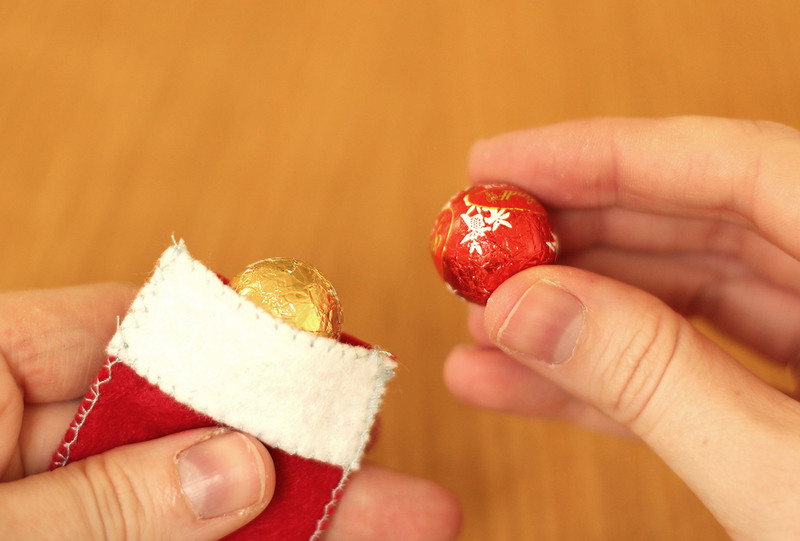 And there we go, early festive treats in three easy steps. I don’t know about you but I’m always taken by surprise when New Year rolls around, I’m so distracted by Christmas it’s a bit ‘oh! there you are’ on NYE. If your experience is anything like mine you’ll need a make which is easy on the budget and low hassle. 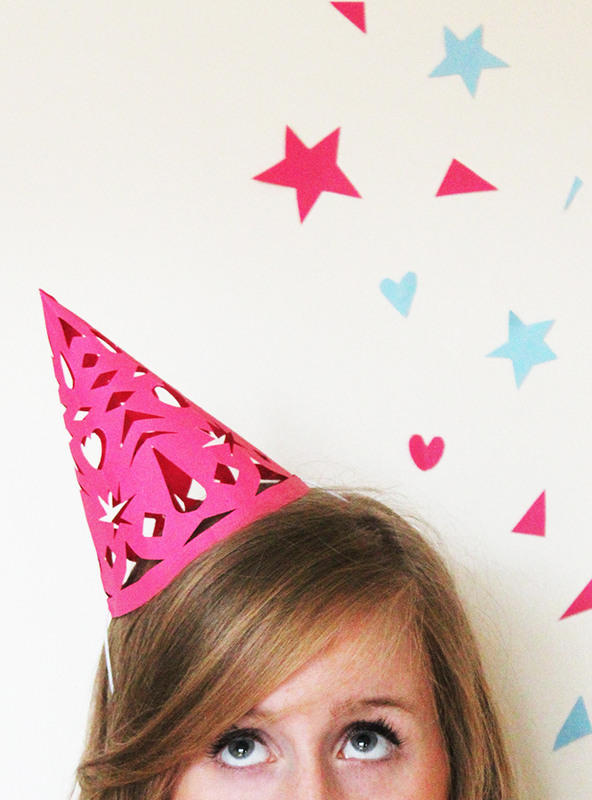 I present to you cut out party hats. 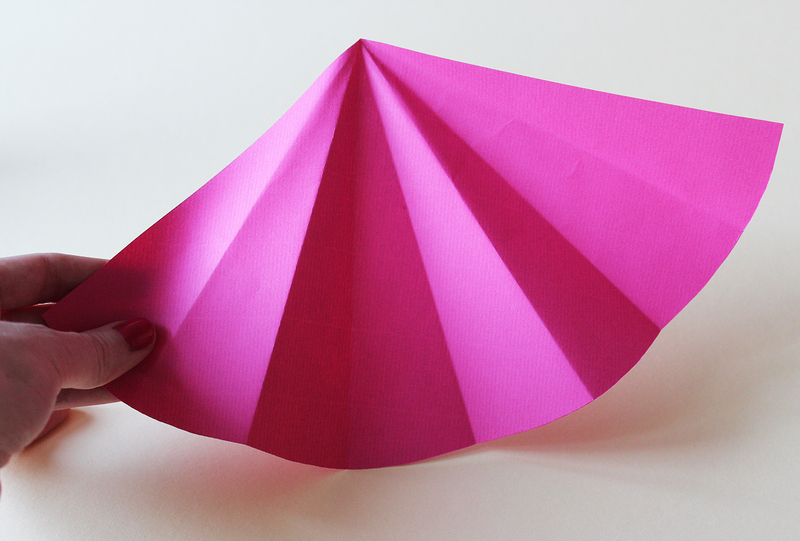 Cut a corner off your sheet, at a 45 degree angle. 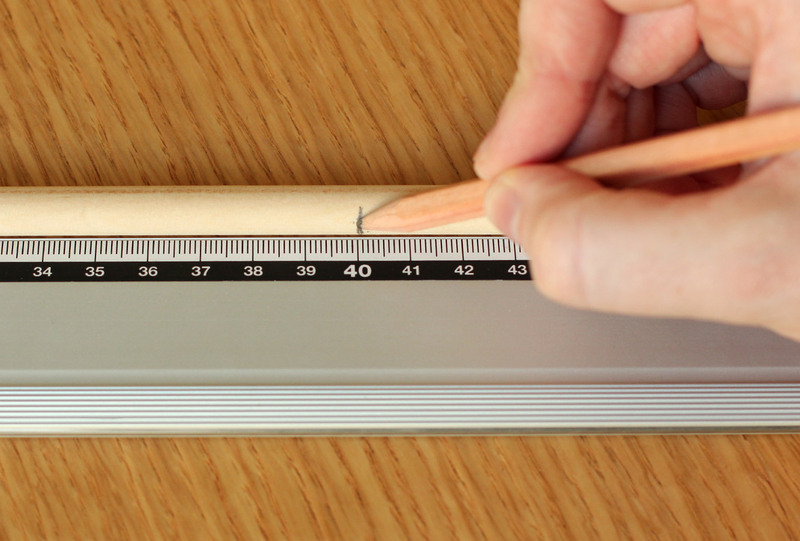 Don’t worry if you don’t have a protractor – just fold a scrap piece of paper to a point on one of the corners and use as a guide. 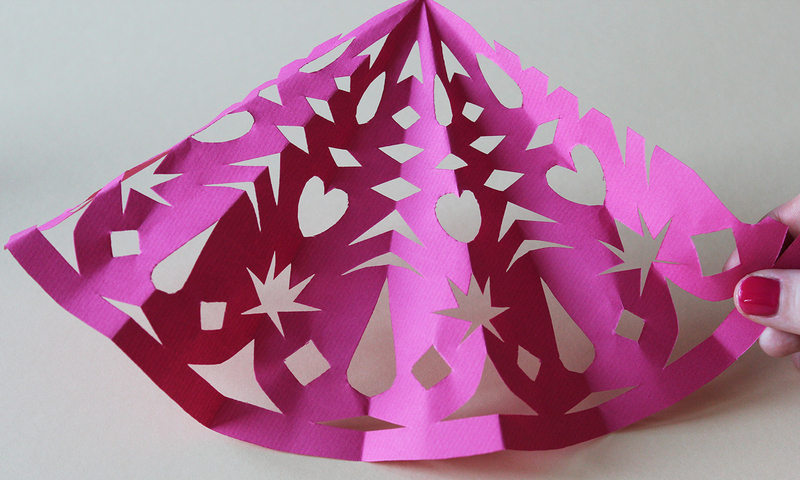 Make the first fold by matching your cut edge to the top edge of the paper. Essentially making a point from that wide angle you just created. Fold at least twice more. My paper was quite thick so this is as far as mine would go without forcing it, but feel free to keep folding. Find the shortest edge going across your hat, and cut the excess off at this point. 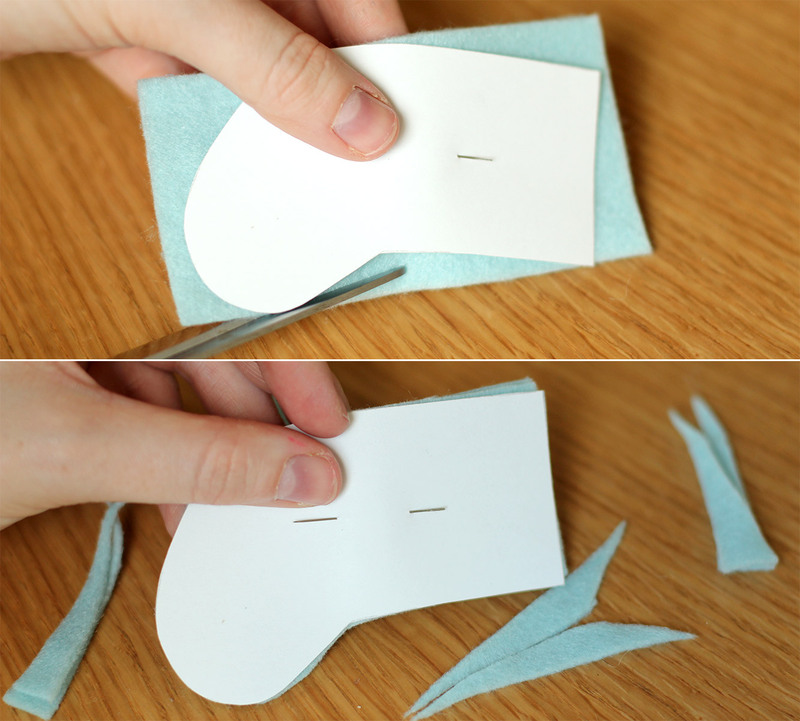 Unfold to check your curve is ok, if not neaten any points with scissors. Fold back up and make your cuts. 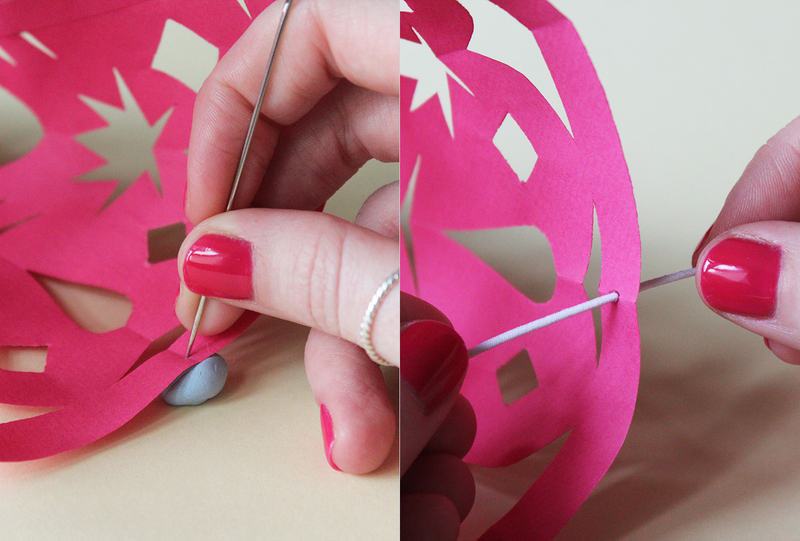 This is generally easier with paper but then if you over cut you weaken your hat so keep a good balance! 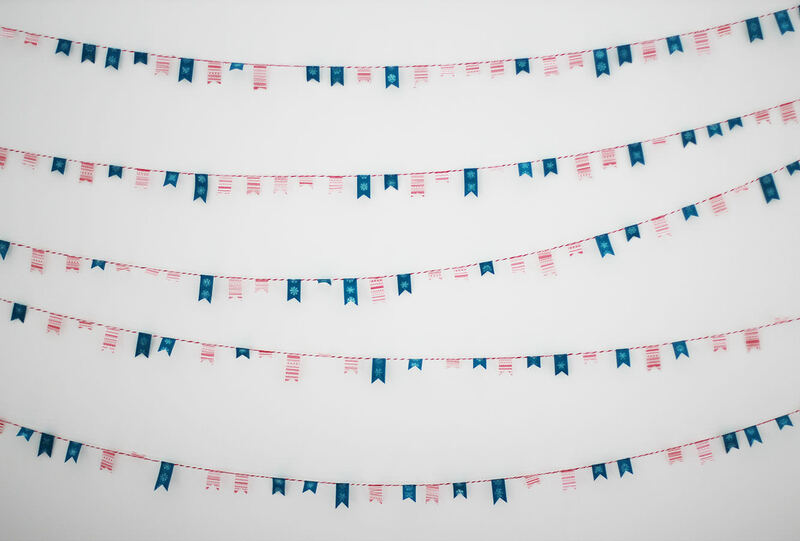 Make sure you keep a line at the bottom in tact so you can add your string and wear your hat. Unfold and survey your masterpiece. Iron this flat or leave under a heavy box/book for a few hours. The thinner your paper/card the more of your creases you will get out, but don’t worry too much, you won’t really notice on the finished item. 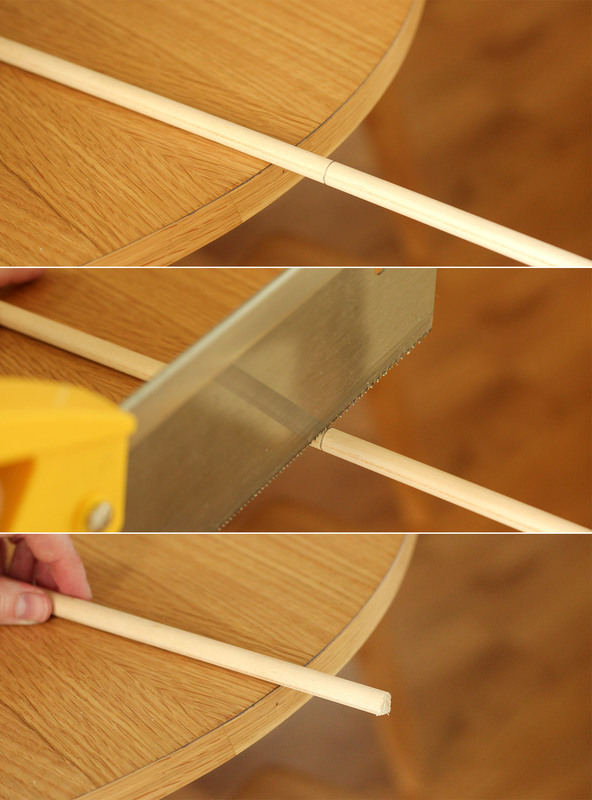 Retrieve that discarded corner from earlier, and cut a strip from the longest edge. Cover in glue or double sided tape and assemble your hat. I then cut a second strip and stuck inside to strengthen the hold. Bit of a Blue Peter moment here…place bit of blu tac/banana under your hat edge and use something sharp to make a hole. Repeat on opposite side. Now, I had some elastic lying around. If you do too, measure it under your chin and round the sides of your head, but make sure to cut it slightly shorter than this distance so that there’s some pull to keep it in place. Push through the hole and tie a knot on the inside. If you don’t have elastic do not despair; string or thin wool will work too, you can just do two long strips and tie in a bow under your chin. Put on head, have great time. It feels wonderful to be tucked up under a blanket when the wind is wailing and the rain is smashing against the window. But if you don’t have one of these in your hands, you’re missing a trick. 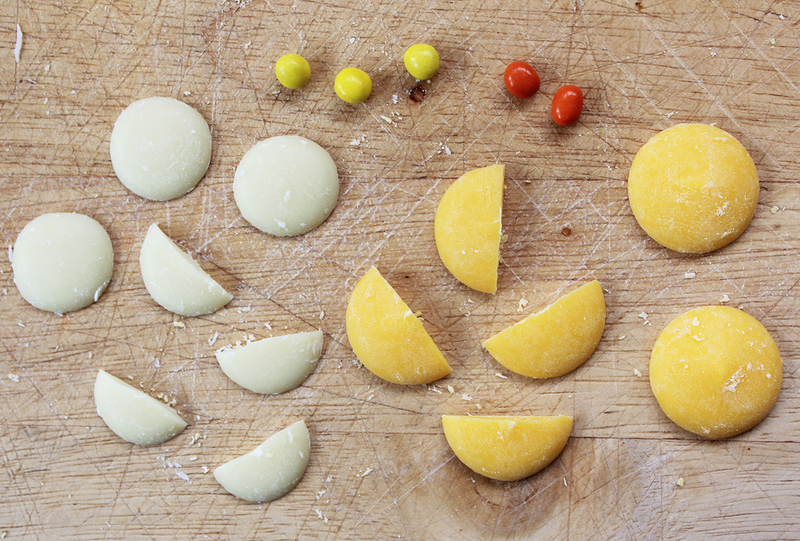 Calorie counters, you might as well close your browser window…you are not welcome here. 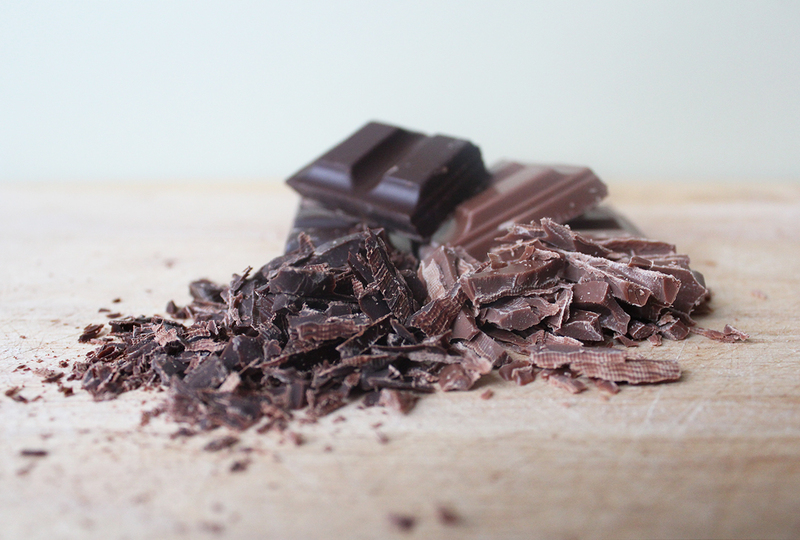 Prepare your stomachs, this is for people who are serious about chocolate. 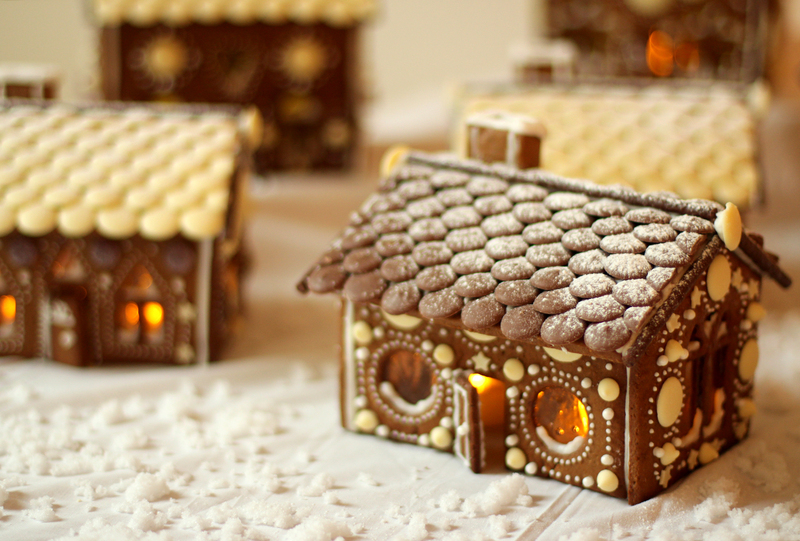 A perfect treat for little elves to take a break from all the Christmas busy. 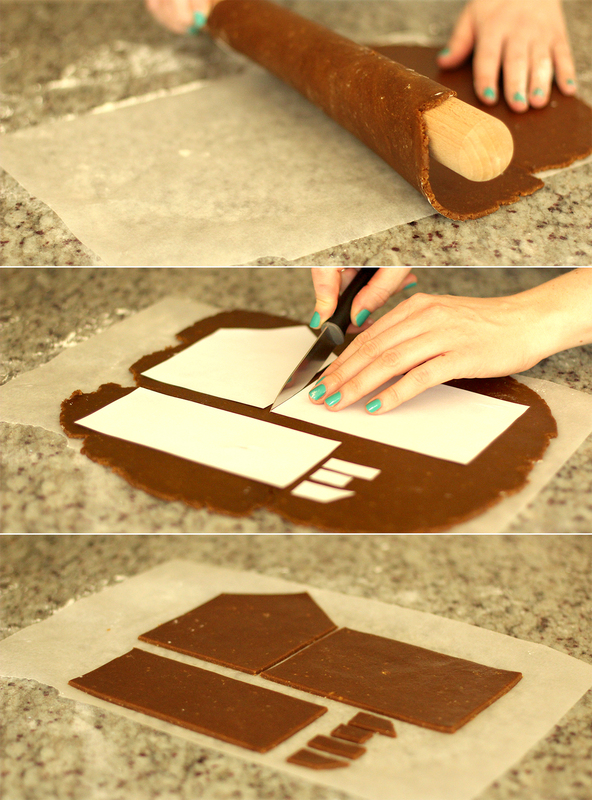 Chop chocolate finely. I find a bread knife works really well for this, as the serrated edge somehow stops chunks flying all over the place. Put aside in heatproof bowl. 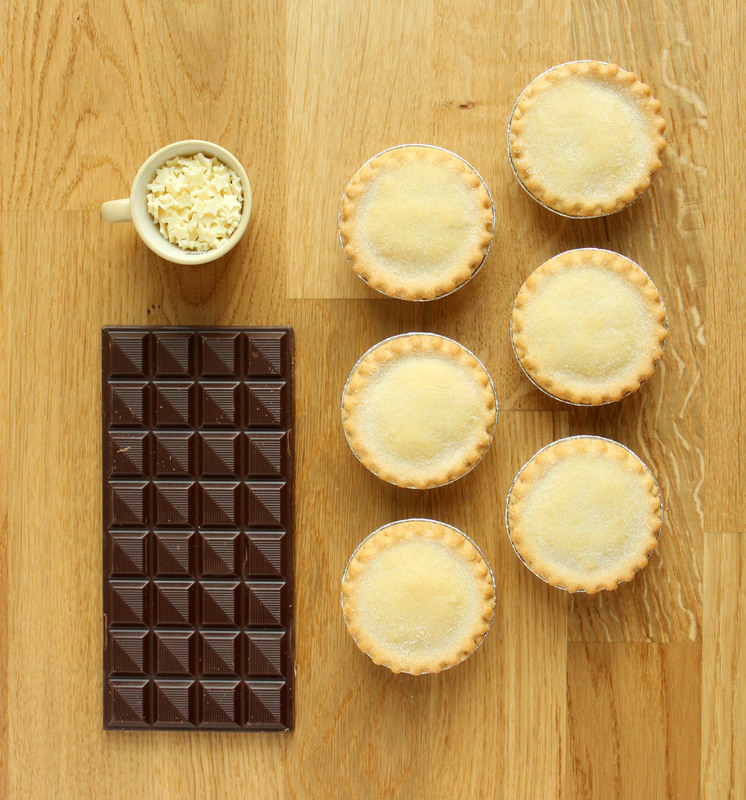 Feel free to adjust the chocolate quantities to your taste. 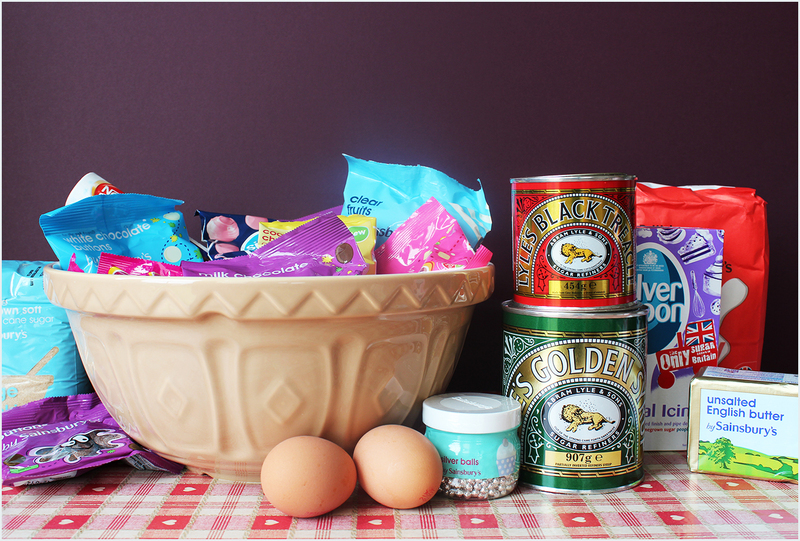 I am not only a chocolate addict but a huge sweet tooth, so I very much orientated the recipe to junkie level. Put 200ml of the cream, all of the milk, and the peppermint extract in a pan on the lowest heat. About 1/2 a teaspoon of peppermint extract will suffice, anyone particularly keen on mint can also whip some into the topping. 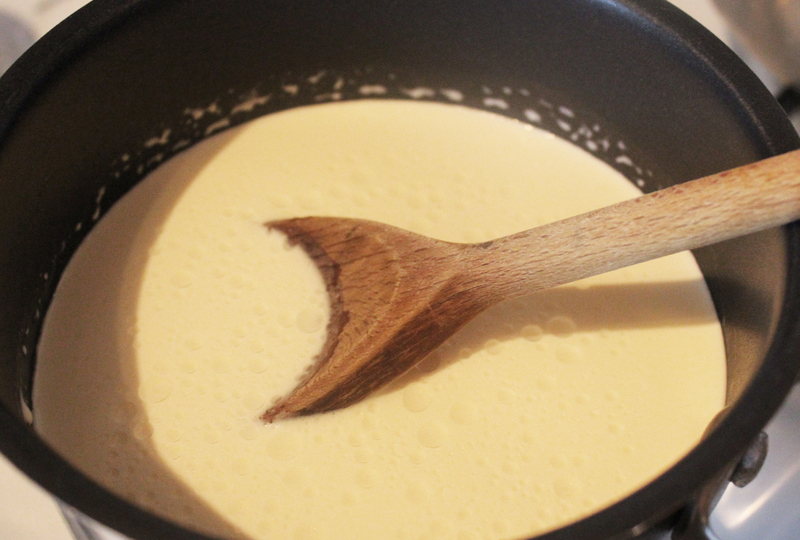 Speaking of topping, a little tip…my pot of cream was 300ml and also had a handy measuring gauge on the side. So I split 200ml into the pan, 100ml in a bowl and then used the pot to measure out the milk, simples. I got mine from Sainsbo’s, not sure if the other supermarkets do the same, but they should. Even if you don’t have this marker, just do it by sight, one third to two thirds. 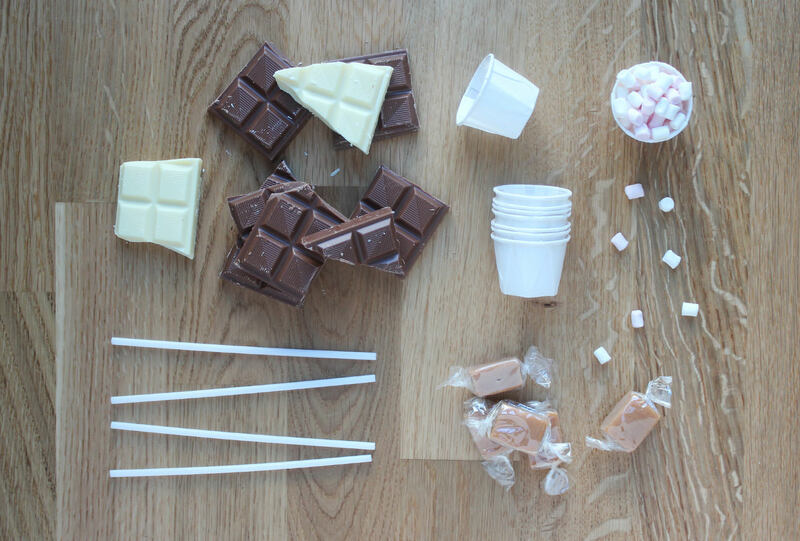 Use same principle for measuring the chocolate, this should be easy, no scales/measuring jugs allowed. 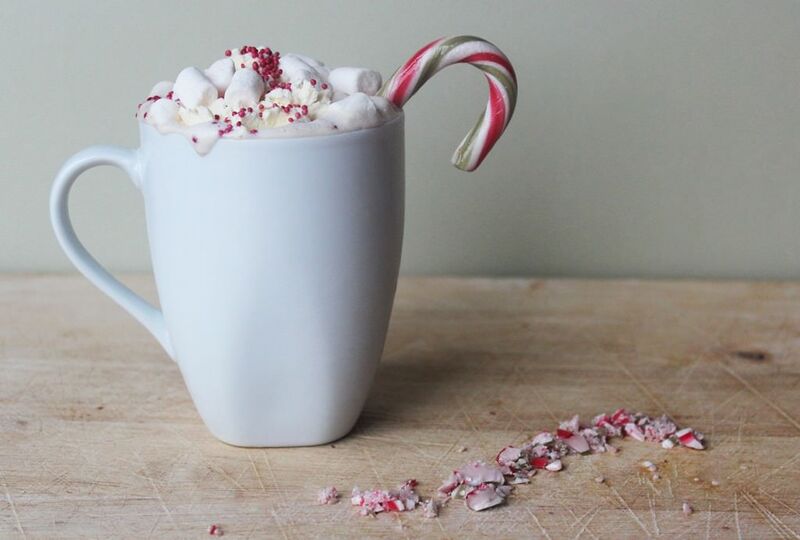 While the cream and milk are slowly heating, use a whisk (preferably electric – don’t burn and unnecessary calories now) to whip the remaining 100ml of cream until it thickens to a ‘dollop-on-top-of-a-hot-chocolate’ consistency. Now, I didn’t get a photo of this but you need to heat the mixture until little bubbles cover the surface, and the steam sort of dances over it. You’ll know when you get there – I’m not mental. Make sure you stir regularly and try not to let it boil or burn. Be patient, it will pay off. 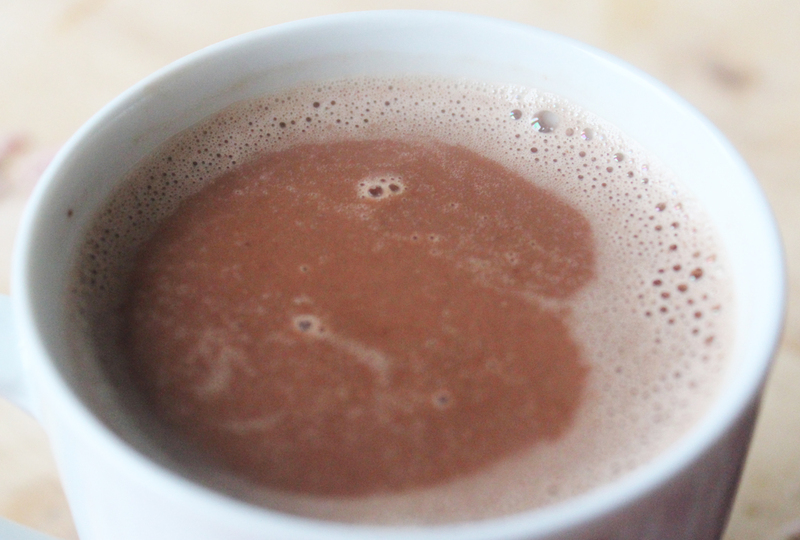 Pour the hot crilk (cream+milk=crilk) onto the chopped chocolate. 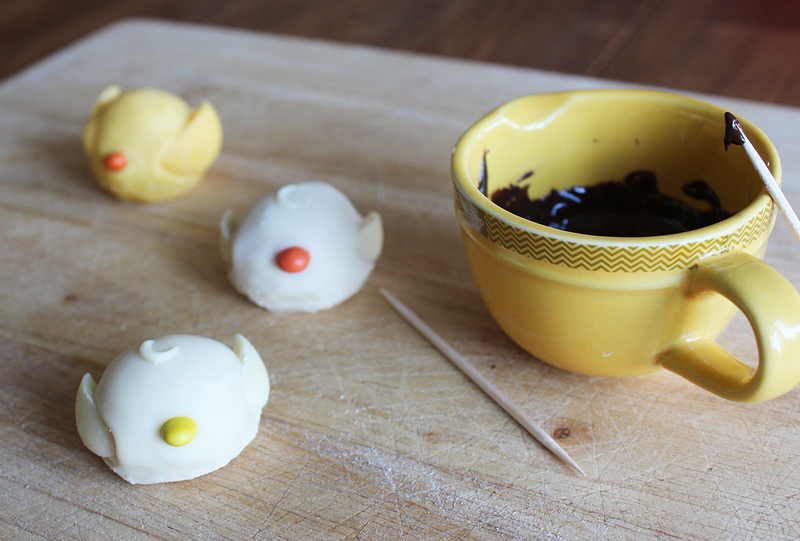 Stir quickly with hand whisk until all the chocolate is melted. 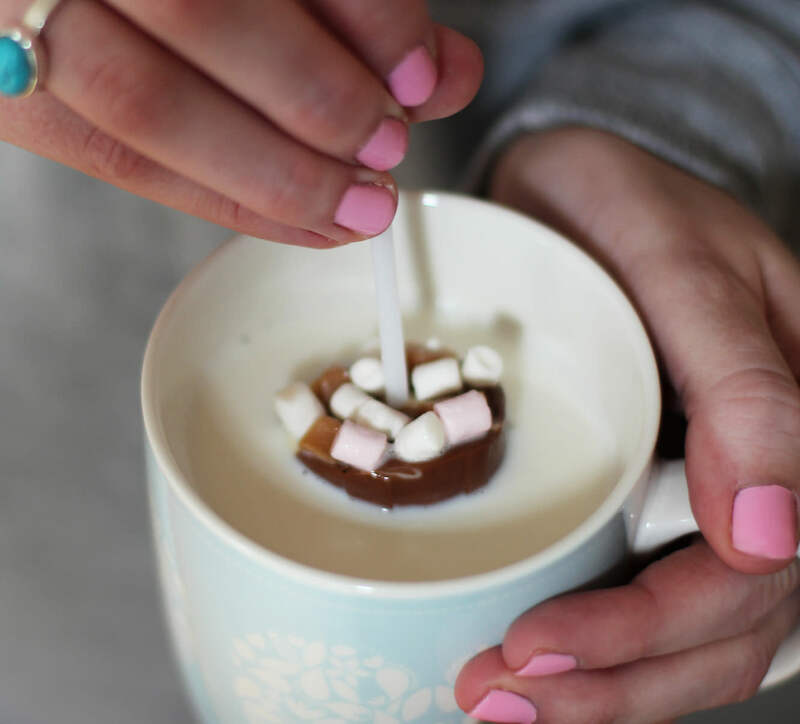 Ladle into mugs. The mixture should be hot enough, but if you have asbestos mouth, then you might want to pop in the microwave for 20 seconds, or preheat the mugs with boiling water first. It already looks (and tastes) super yummy at this stage, and personally I’m not usually one for whipped cream on my hot chocolate. BUT IT’S CHRISTMAS. 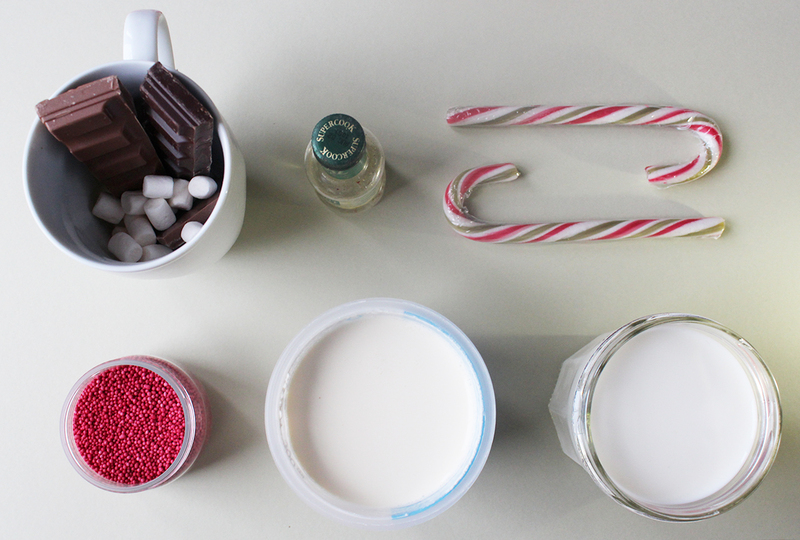 Divide the cream you whipped earlier onto your cocoa, and cover with mini marshmallows and sprinkles (mine were another Sainsbury’s buy), stick in a candy cane stirrer and prepare to enjoy. At last, time to decorate. 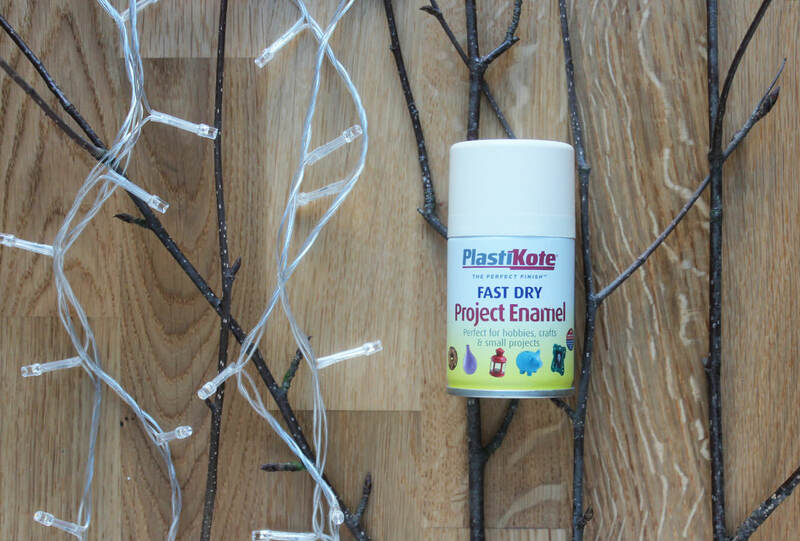 This is by far the best bit, and your opportunity to hide any blemishes. For me, that was a whacking great crack down the front, the odd broken window pane and some darker than attractive edges. 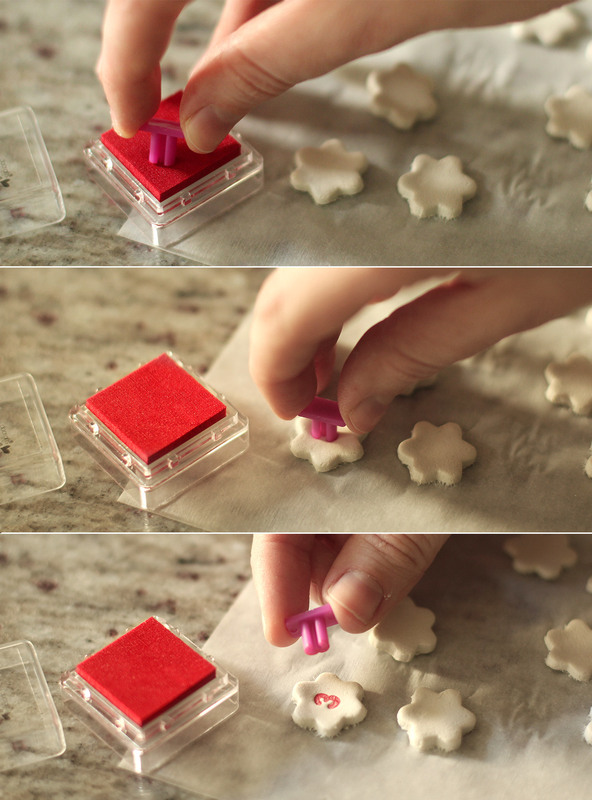 So fill your piping bags, stick on a Christmas film, or phone a good friend using hands-free and enjoy! There are no steps in this post, just some ideas to get you going. 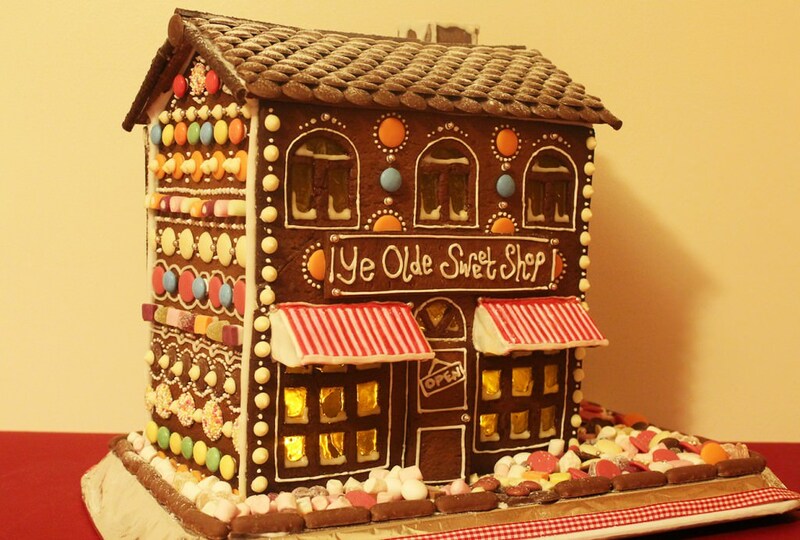 When you’re buying your sweets you should have a think about roughly what will go where, specifically in terms of the roof. Make sure you overestimate how much you think you will need, it’s always surprising how quickly everything disappears. Particularly if you adopt a ‘one for the house, one for me’ approach, which is the correct way to do this in case you were wondering. I chose button tiles for my roof. The key is to make sure there is some overhang on your first layer, and then just keep going in lines, overlapping slightly, until you hit the top. Chocolate fingers or matchmakers work for a sort of log cabin look, or I’ve seen shredded wheat for a thatched roof (not sure who would want to eat that though!). 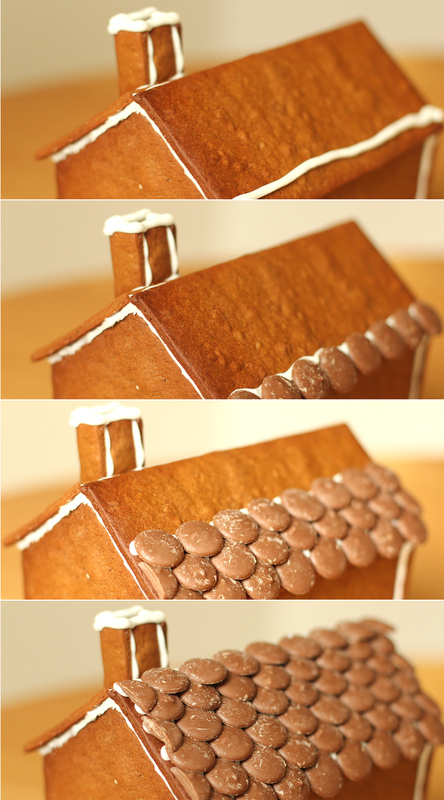 Once I had finished I dusted my roof with some icing sugar snow for a wintery look. The last couple of years I’ve done normal houses, but I’ve decided to start theming them more now I’ve got the hang of it a little bit. 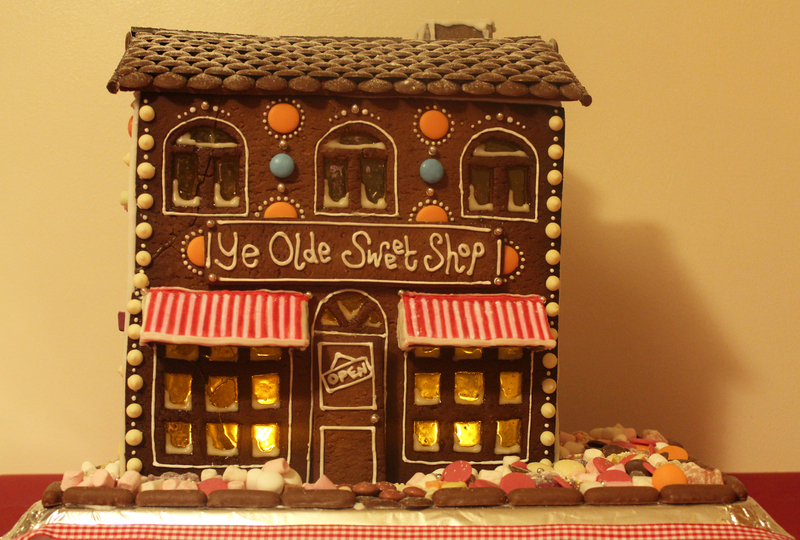 So this year’s effort is designed to be an old fashioned sweet shop (it seemed apt given the sugar coma it put me in). Obviously it needed an awning or two! I just coloured some of my icing red and alternated between the two colours until I reached the end. If you want straight lines then the trick is to hover away from the biscuit a bit so you have more control over the direction. As you can see I bought mainly different coloured and sized circles: chocolate drops, silver balls, smarties and chocolate buttons. 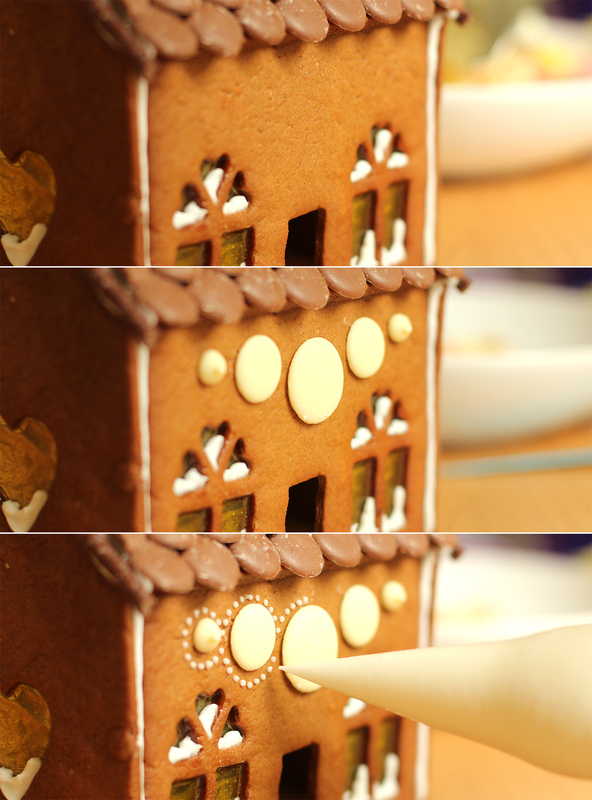 I like little dots of icing to decorate with too, but you need to decide what works best for you, it should be fun! I don’t really pre-plan, but buying lots of similar shaped things helps I think. That’s not all… remember this little guy? Well I decorated him too. The base he was sitting on is actually the lid of a gift box, I won’t show you what’s inside though, incase the recipient is reading this (there needs to be some element of surprise!) This adds a lovely personal touch to any present, or can just be the present in itself! The front and back are A6 size (A4 paper folded into quarters) and then measure everything else out based on that. You can get at least four of these guys out of one batch of mixture. 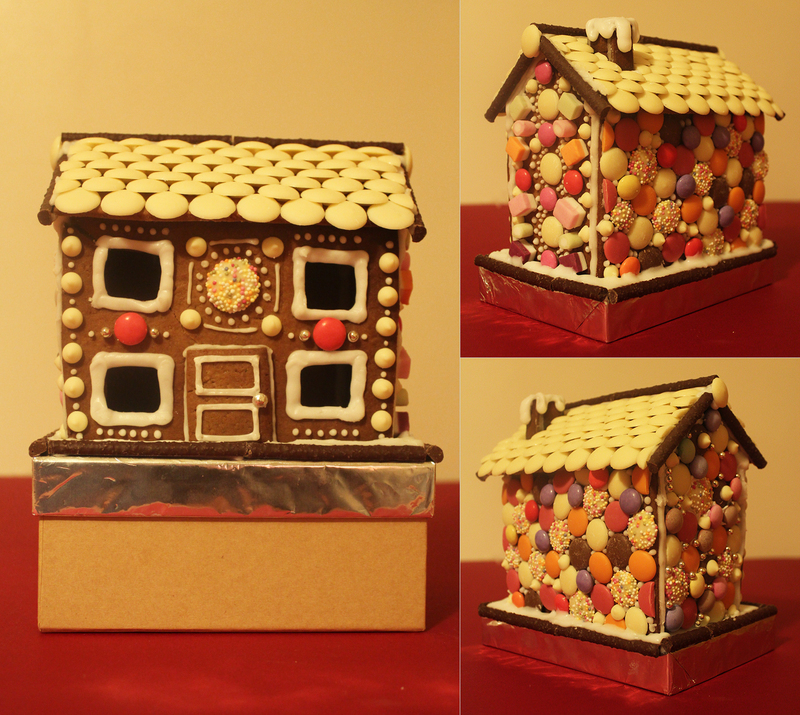 A homemade festive gift without the fuss for someone you like, but not an ‘I made you a gingerbread house’ level of like. To make a tree the easiest thing to do is to get your hands on star shaped biscuit cutters of at least three or four different sizes. 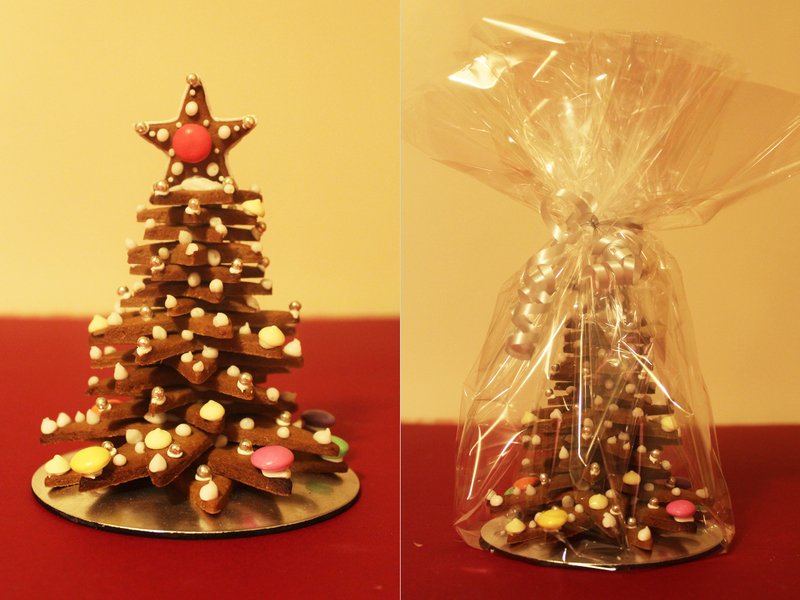 You want around 16 or so stars for each tree, then just stack them with icing to stick each layer together. If you don’t have cutters then make some templates to cut round instead (you can do this using auto shapes on the computer). One batch of mixture should make at least 8 I reckon. Pipe lots of blobs of icing and add silver balls, chocolate drops and smarties for decoration. I used a candle holder turned upside down for the base, but a disc of cardboard covered in tinfoil would work just fine too. Remember, whatever you use, you aren’t going to get back! The cellophane I used to wrap it was bought from a florist supplies shop online and was about £3 for the roll, which I’ve been using for various projects for about 2 years! Cut a big square (bigger than you think), I made one as large as my roll would allow. Place tree on the middle and bring all the corners to meet in the middle. 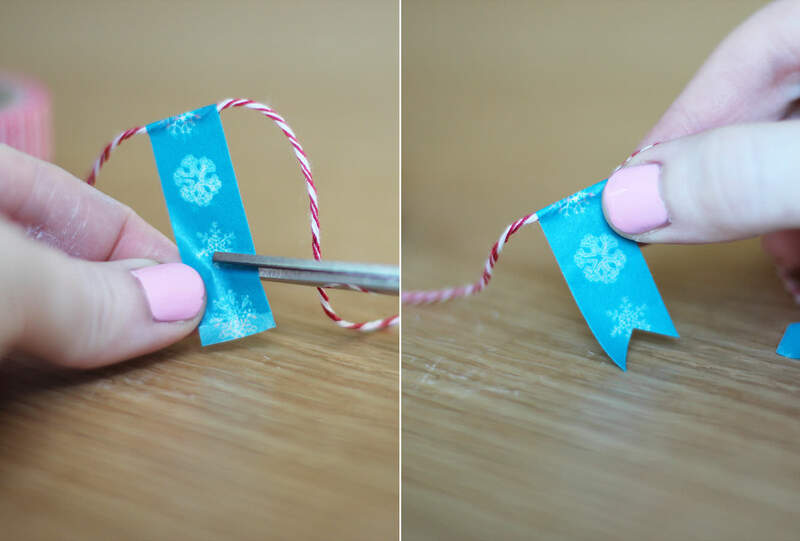 scrunch the remaining edges together and call for help (this will save your little finger aerobics when you’re tying the ribbon). 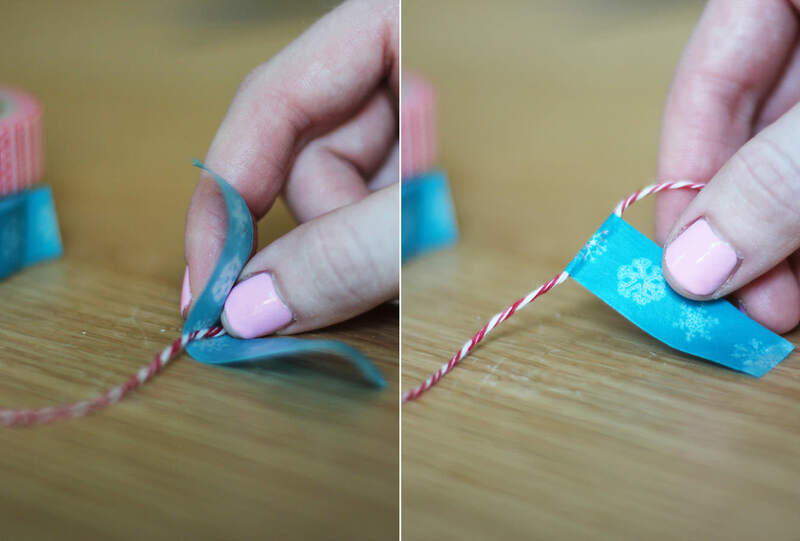 With someone else holding it all together, double knot a few pieces of gift ribbon and curl the ends with scissors. Chop off the messy bits of plastic. So, I have a confession to make, I didn’t actually photograph the assemblage of the big house. 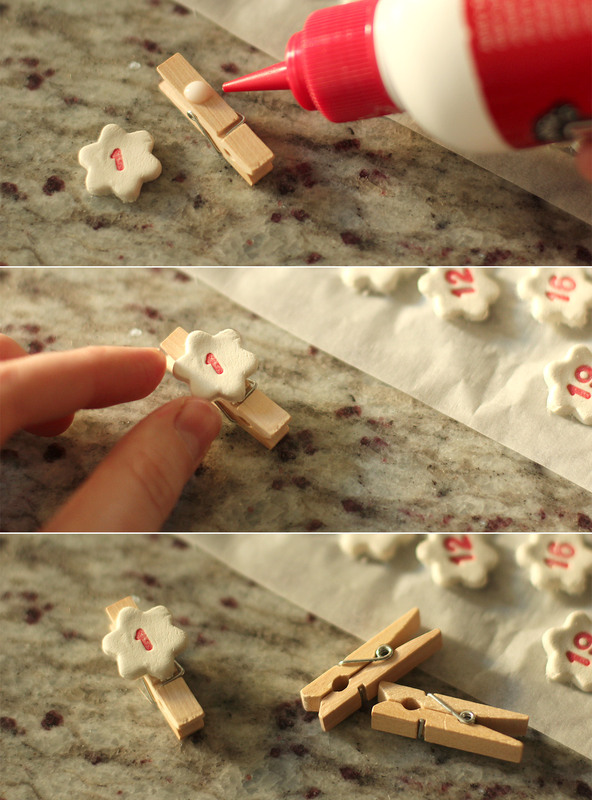 All my fingers and toes were required to hold it together until the icing dried, so there was nothing left besides my nose to press the camera trigger. 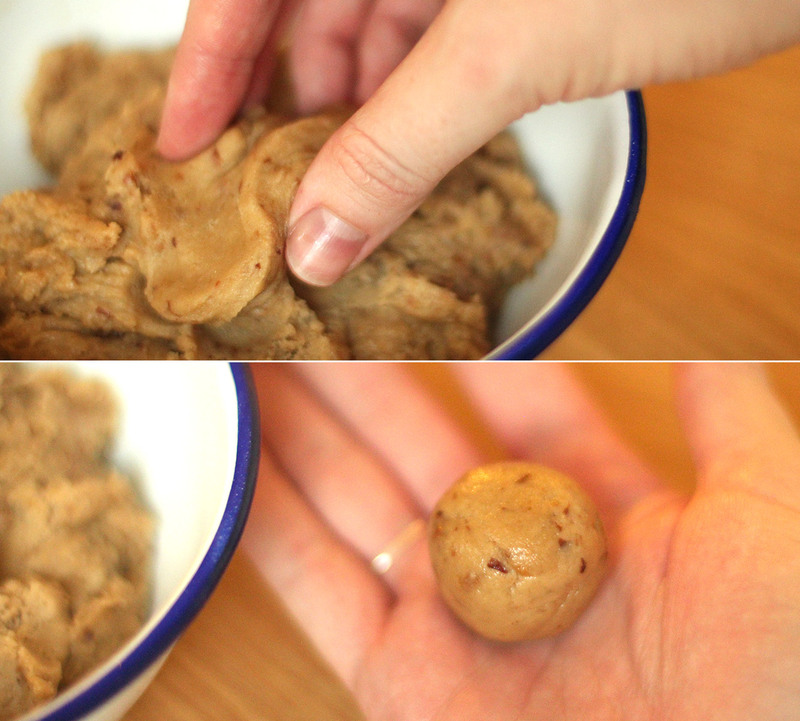 Instead I whipped up another half batch of dough and made a little one to show you how to, aren’t I lovely? Cover base in tinfoil/something pretty. Tin foil works well because it doesn’t soak up the icing. 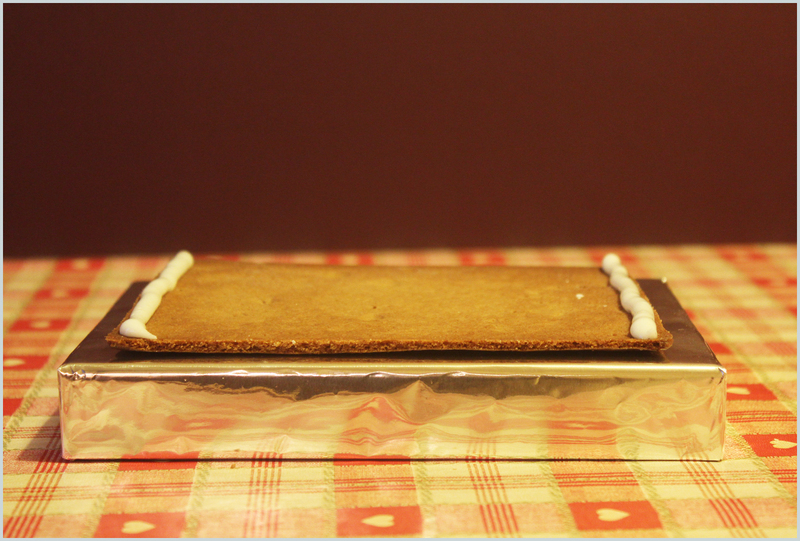 I used an upturned tray for the bigger one, and stuck ribbon where the tinfoil didn’t quite meet the edges. Chopping boards and baking trays also make a good base (but make sure you don’t need them for Christmas dinner first!) 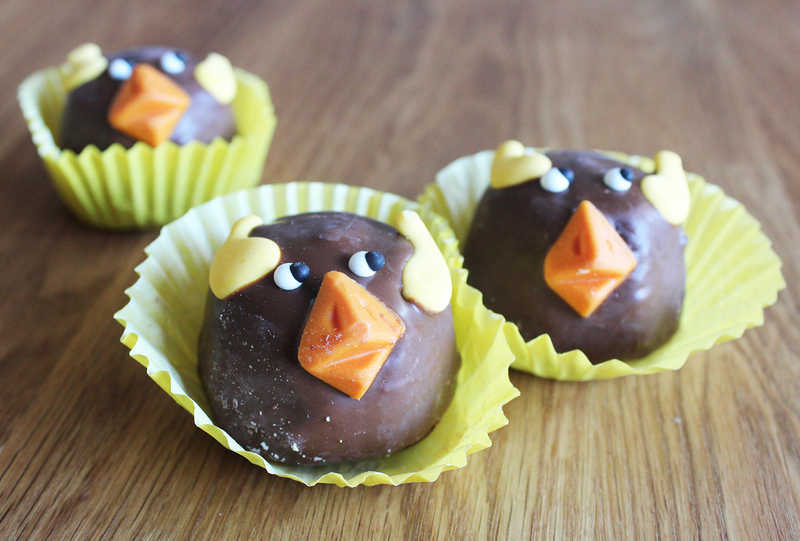 Alternatively you can buy one, but that would just eat into your sweets fund. Nobody wants that. Mix up your royal icing and put in icing bag. It has to be pretty thick, or construction will be hard going. 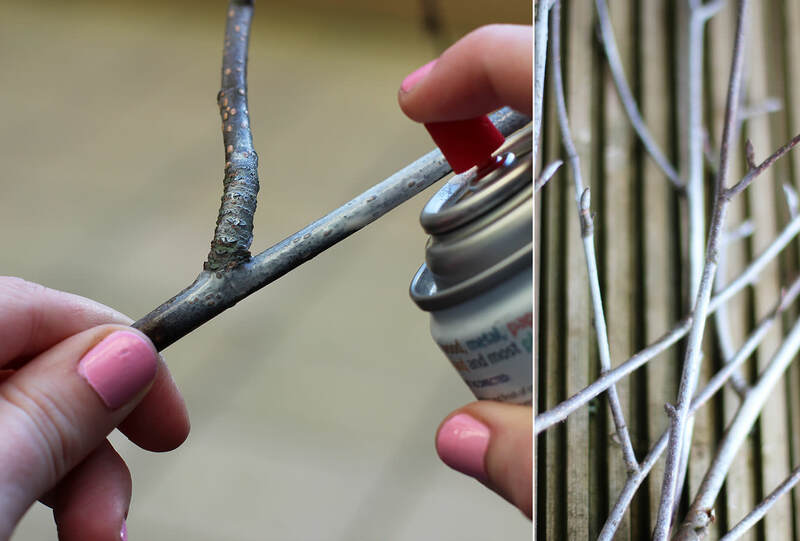 At the same time, make sure you can pipe it without getting hand cramp. 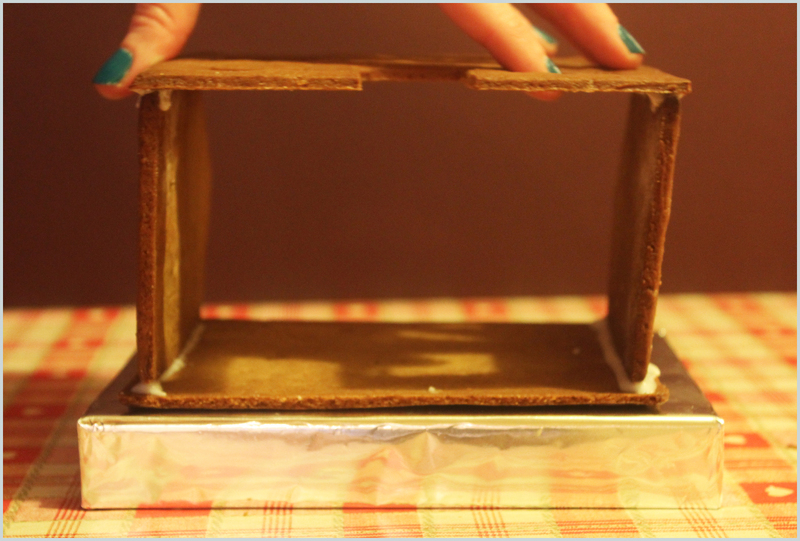 Place back wall on a flat surface (if you use your base you have less far to travel when you flip it). Pipe along the two sides, as shown above. Attach sides and hold for a while until the icing starts to dry, you might want to get another pair of hands involved here, or the salt and pepper shakers to everything in place. Pipe along the top edges. Place the front on top. Definitely don’t drop it on your way over and crack it. That would be really silly. Flip it! This is where with anything bigger, you will need someone else to help. Now you can see the crack *sob*. 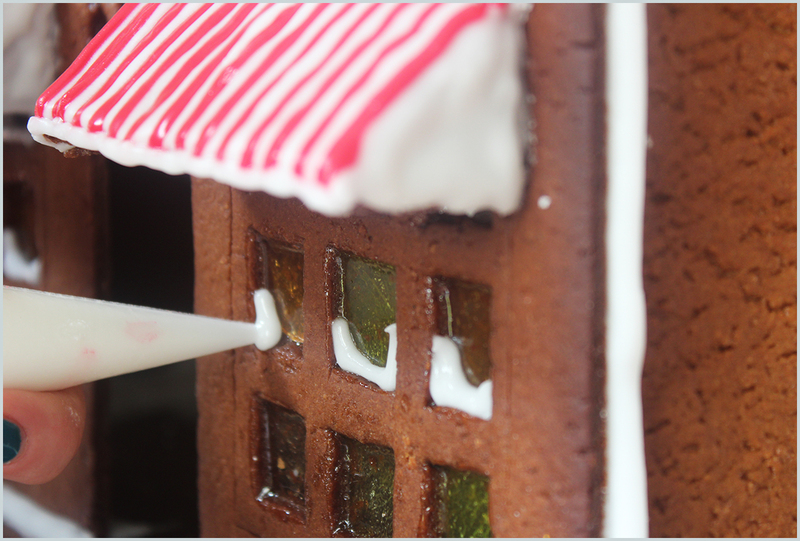 So this also happened to my big house, I might show you in the next post, but I’m still deeply saddened by that (the sugar windows stuck to the tray rather than me dropping it but still, a perfectionist’s nightmare). I’m basically a massive klutz. All is not lost though. 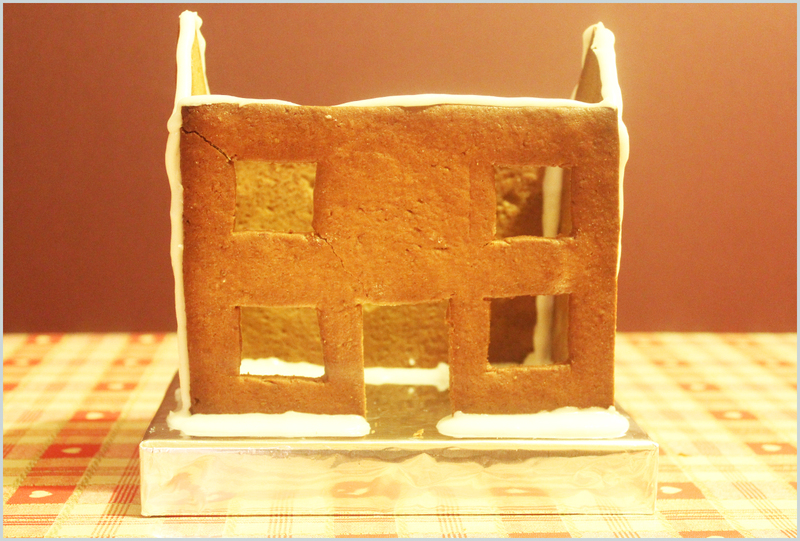 At this stage you are unlikely to want to make any more gingerbread. So if this happens you need to make do and mend. 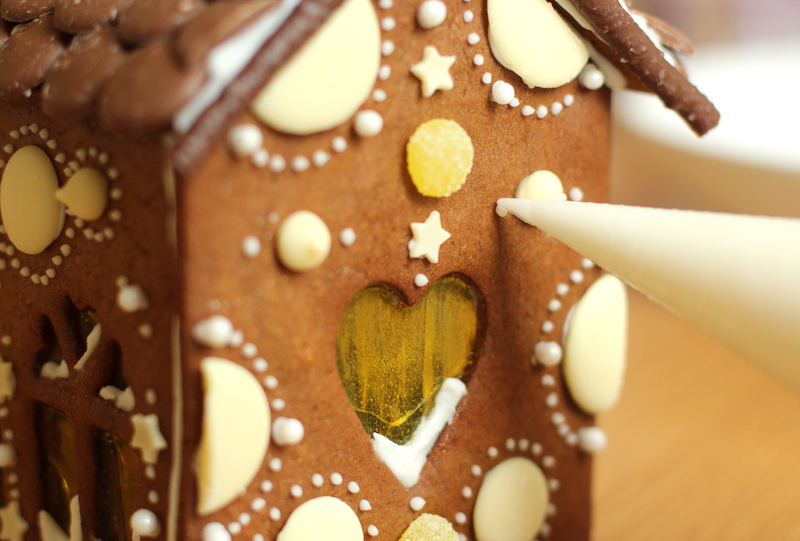 This can be done with royal icing, but you’ll get a white line along the cracked bit. A better (albeit more perilous) way to fix the cracks is by making a sugar syrup. Essentially all you need to do is melt down some sugar in a frying pan and voila, you have baking’s version of super glue. Dip the broken pieces into the sugar and stick. Be careful though, definitely not a game for children to play. Sugar syrup is dangerously hot. If you end up dipping your thumb in it, don’t let your gut reaction be to stick it in your mouth to cool it off. That is a most unpleasant experience. Some people use sugar syrup to put their whole house together, but quite frankly, I value my life more than that, I’m far too clumsy. Now you have it upright and relatively stable, ice it all over. 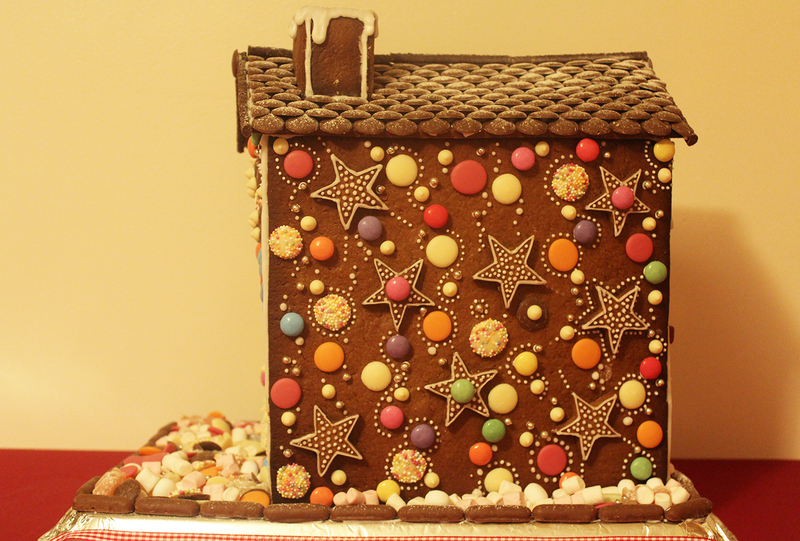 This looks a bit messier on a little house than a big one, but basically go around all the edges inside and out with icing. You can really go to town on the inside corners as nobody will see them, the more you can reinforce at this stage the better. 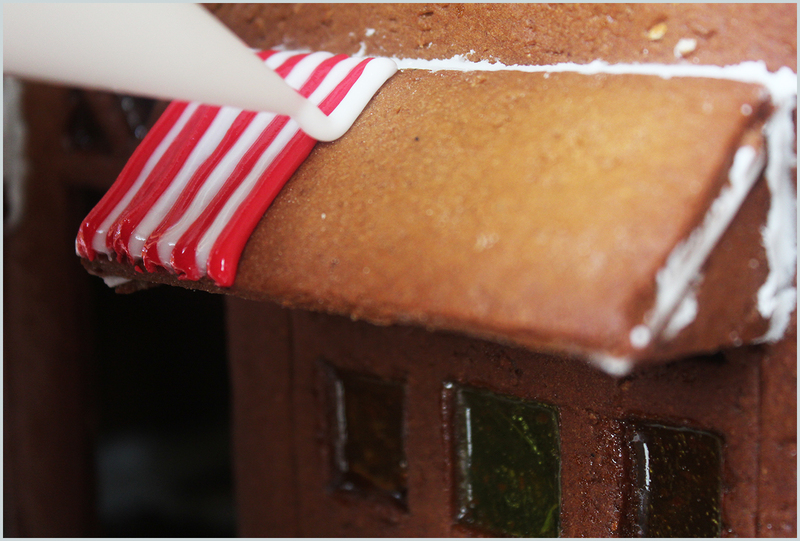 Stick the roof on and leave as long as you can to dry before decorating. Stay tuned for phase three later this week. Three and a bit years ago I stumbled across a marvellous young lady called Anna. She gave me the inspiration to start a new Christmas tradition. 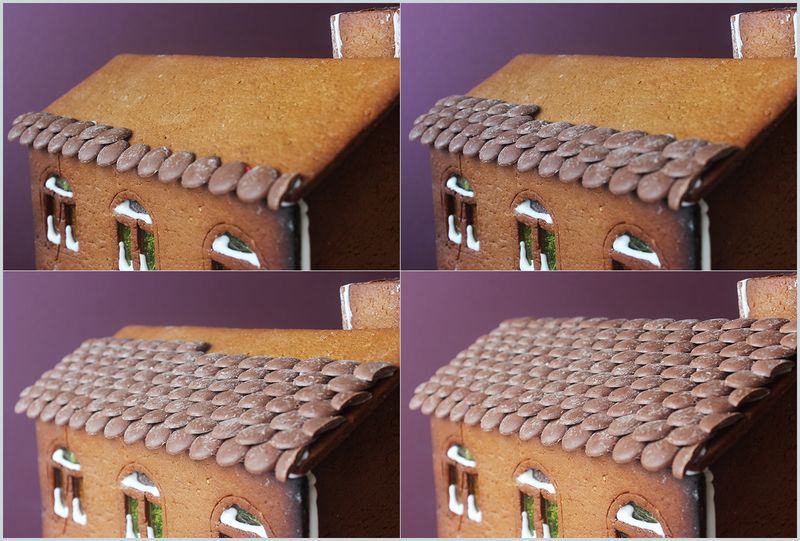 I implore you to do the same, there is very little as satisfying as creating a freestanding gingerbread structure – and I won’t lie, it helps that you have a year in between to recover and block out all the royal icing acrobatics it took you to get there. Apologies in advance for some of the slightly odd measurements below, the recipe is a bit inbred at this stage. Original credit goes to Anna, but I’m not convinced she would still want ownership given my Canadian to English translations and elaboration on the method (I lost the original). Draw out your design on greaseproof paper. I did write down the dimensions of mine but I suspect it ended up in the recycling with a flurry of lists and post-it notes, but it is relatively straightforward maths. 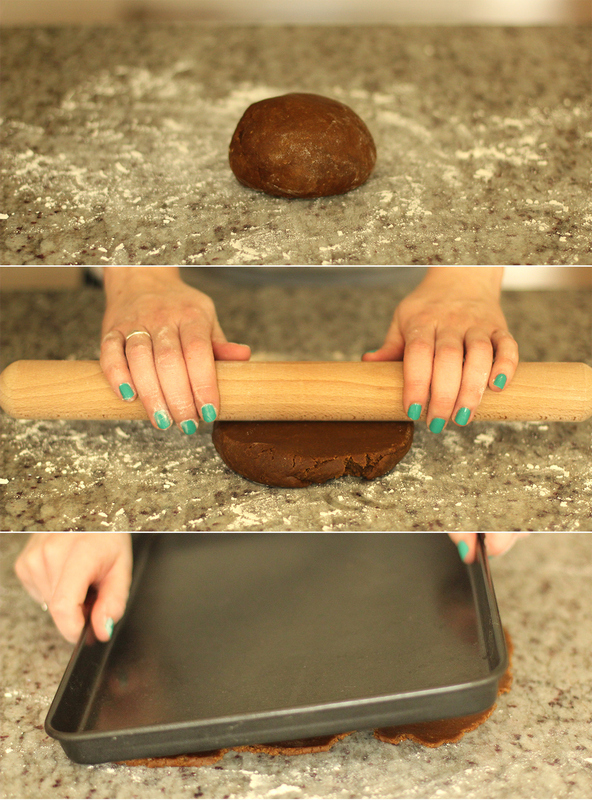 Measure your baking trays and base first. I hope that doesn’t sound too obvious, I’ve had to go back to the drawing board before now, after realising to my disappointment that I don’t own industrial equipment. When drawing the chimney, draw it directly onto the roof so that it is definitely at the right angle to put on your house later (see photo above left). Don’t forget you need two little rectangles as well, one the same height as the short edge, and one the same as the longer side – they should be the same width. Draw the front and sides first so you can take the measurements for your roof from those, make sure you add a little for overhang etc. Mark x2 or x1 and something to identify the pieces on each – they have a tendency to become unrecognisable at some stage. Mix together the flour, baking powder, salt and spices. You will need a large bowl. 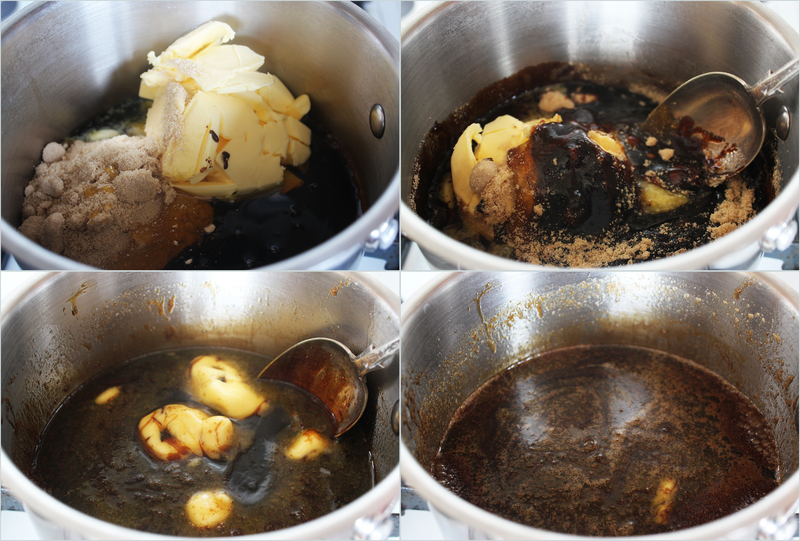 Put butter, golden syrup, treacle and sugar into a saucepan and gently heat until sugar has melted. 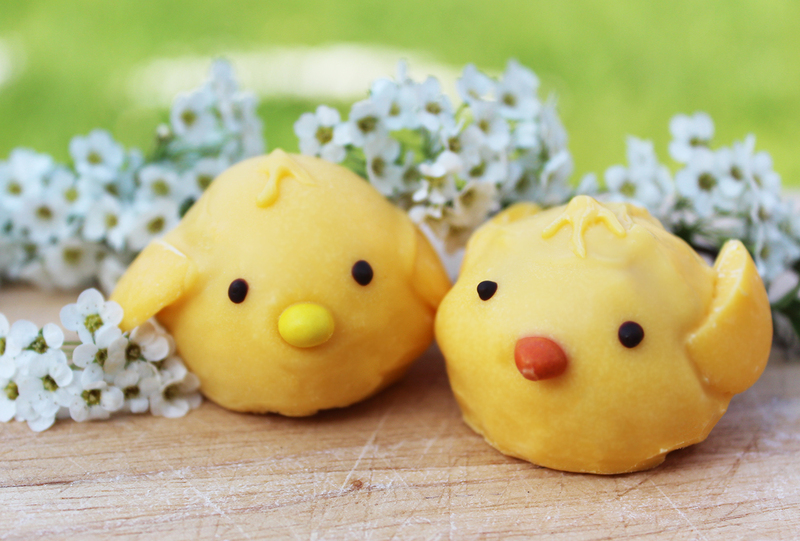 Beat the eggs with a fork in a small bowl and mix into flour mixture. Alternatively you can mix them with the treacle and syrup at an earlier stage and not heat these with the butter. Pour in butter and treacle mixture. 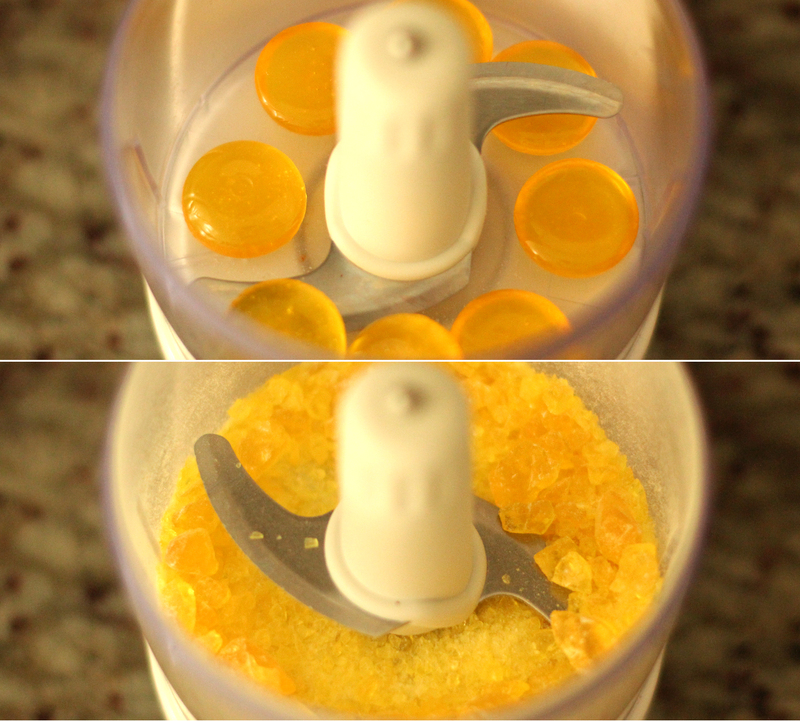 Stir wet ingredients into dry. Place bowl outside or in the fridge until completely cool. 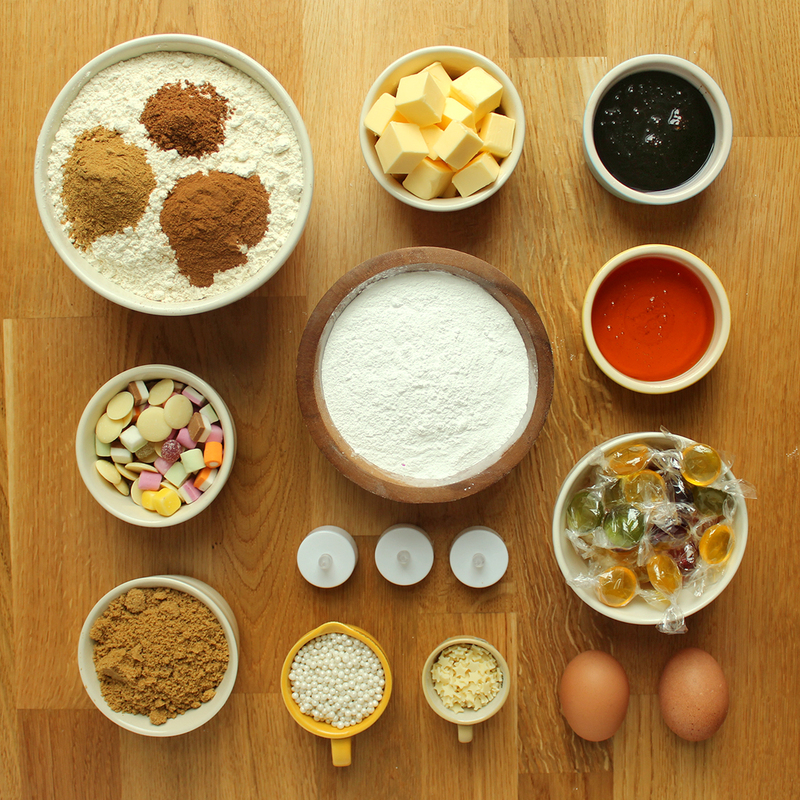 Dust a large work surface thoroughly with plain flour. 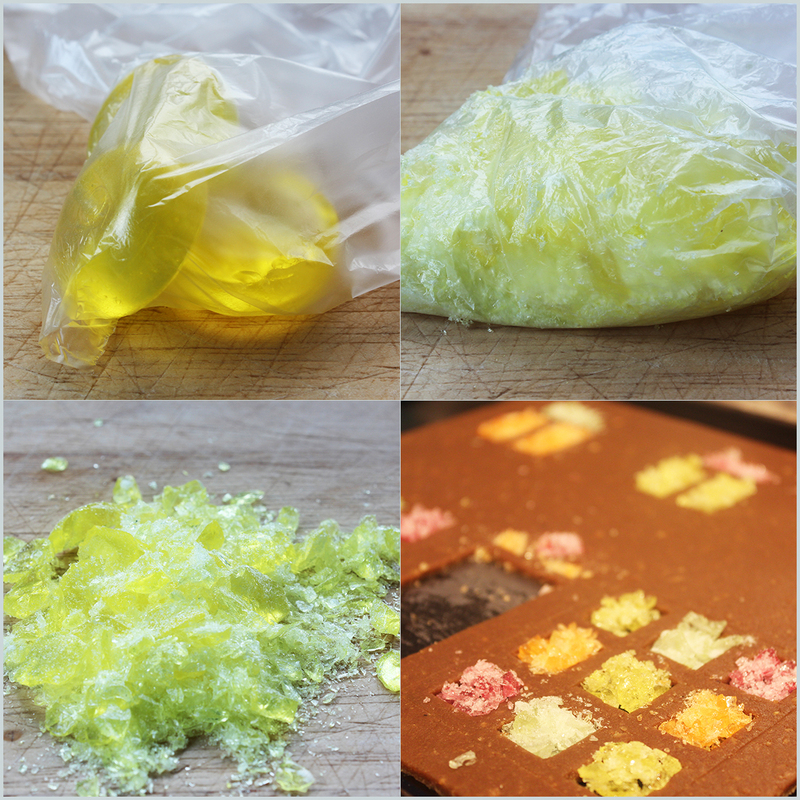 Take a third to half of the mixture and mould into a ball. Sprinkle dough and rolling pin with more flour and roll out. Make sure you keep turning the dough to keep it as square as possible. You want it to be about 5mm thick. Grease baking trays well and then cut out all your shapes. 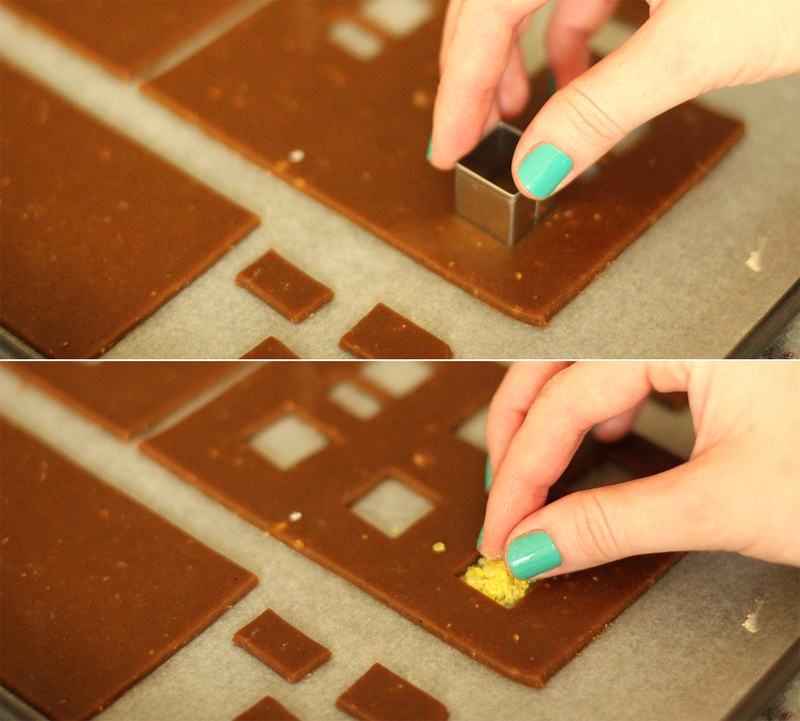 A tip with the larger pieces is to define the rough shape and then transfer to baking tray, in order to finish cutting once it’s on the tray. This will stop it stretching when you move it, as it’s fairly important to keep the edges as straight as possible. Of course, if your baking trays hate you as much as mine do, then they will warp themselves in the heat of the oven just to mock you. When cutting out the chimney, flip the template over so that you can have pieces with right sides facing out all around. 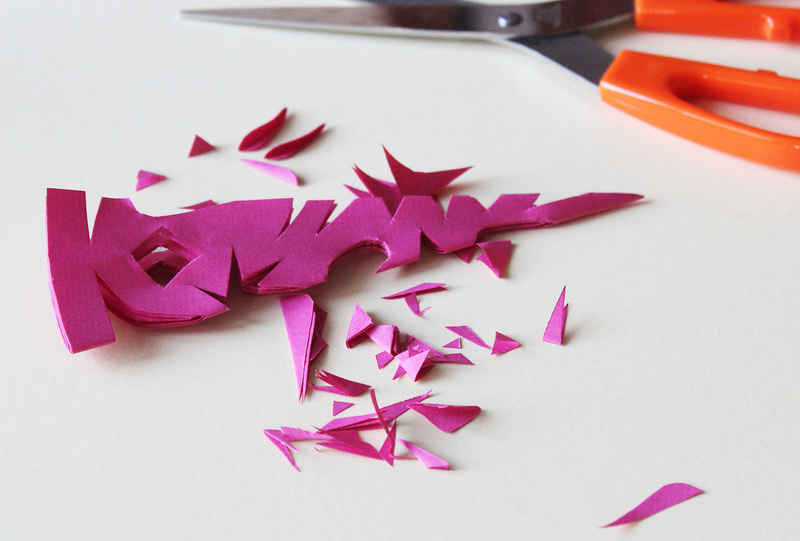 Keep rolling and cutting until you have all the pieces you need. 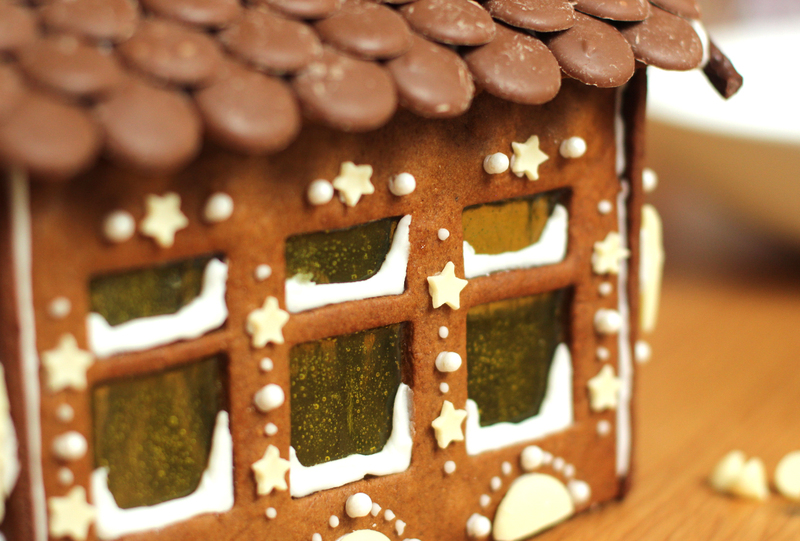 Fill your window gaps with the crushed sweets. The bottom-right photo shows you my fatal mistake. 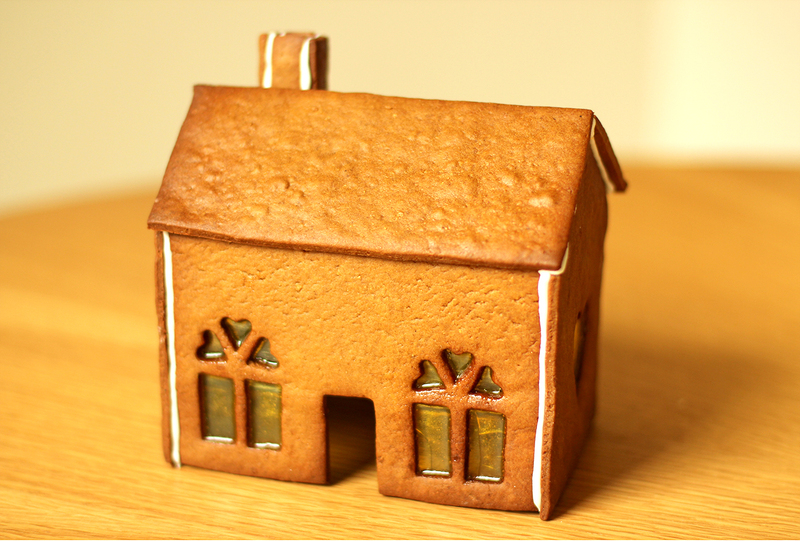 For any pieces with windows like these, put greaseproof on the tray first. Otherwise you might have a spot of bother removing it due to its size, fragility, and your patience levels…more on that later. Bake the pieces in the oven at gas mark 4/180 C/350 F.
Keep an eye on them, as different pieces will bake at different speeds, from 10 mins to 25! 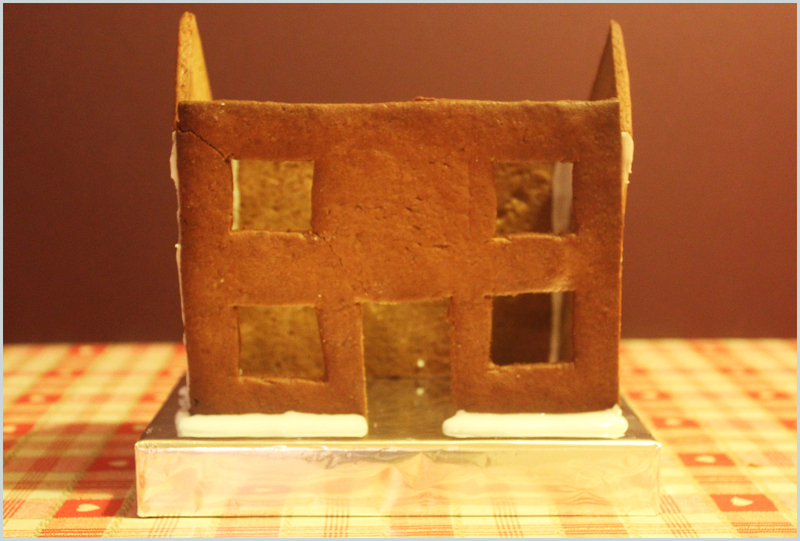 It’s always better to go a bit over than under though, as you can cover the darker areas in sweets, but nothing can hide/save a caved in roof because the biscuit was too soft. 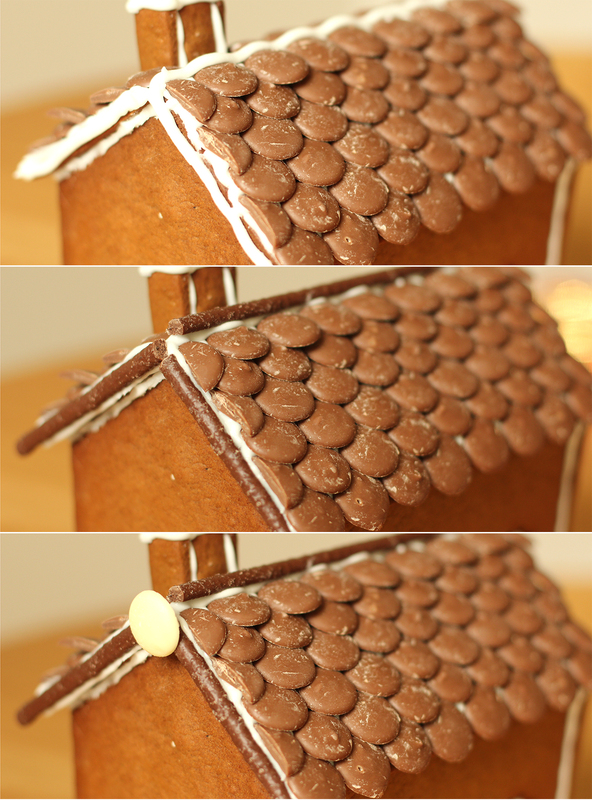 Having said that, my sister did prop my first roof up with a gingerbread dinosaur when I had that exact problem, so all is never lost. Stay tuned! I will be posting a guide to assembling and decorating later this week.